The sleep aid industry is growing by leaps and bounds each year as an increasing number of adults are being overworked and getting less than the recommended 8 hours of sleep each night. There are millions of others who receive the recommended amount of sleep each night and still wake up feeling groggy and tired. While there may be several reasons why so many are waking up tired, you may be surprised to hear that snoring is a common cause of poor sleep quality. Numerous products have popped up on the market in recent years, promising the best night sleep you ever had. The VitalSleep snoring mouthpiece happens to be one of these products. VitalSleep was cleared by the FDA (510(k) Number K092942) in January 2010 and is classified as a class II anti-snoring device. It is a mandibular advancement device that has a lower tray adjustment which can be tweaked using the provided hex tool. It’s made in the USA and is guaranteed to be latex and BPA free. It features the common “boil and bite” technology which provides more of a custom fit, contouring the unique ridges of one’s teeth. Also, it enables breathing through the mouth due to the air hole located at the front of the device. Like all other MAD’s, this product works by holding your jaw in the advanced position, pulling forward the tongue, airway and various muscles. As a result, the airway is cleared from obstructions and the sound of snoring ceases. 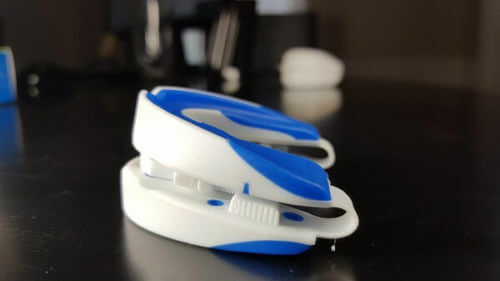 The Vitalsleep mouthpiece was co-developed by The Snore Reliever Company LLC. which is based out of New York, NY. The company was registered in December 2010 but the device did not gain much momentum until just over a year later in January 2012. VitalSleep was created with the help of a doctor who has over 25 years of experience in physical medicine and rehabilitation. 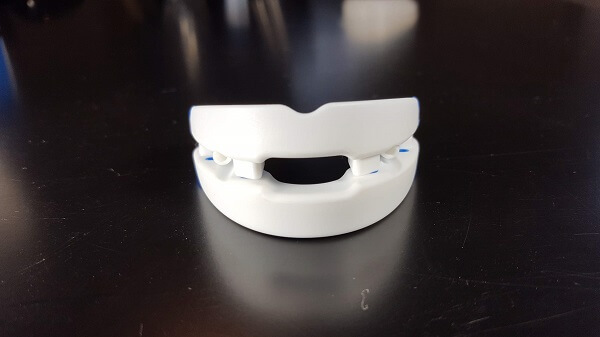 The inventor came up with the idea to create a low-cost anti-snore device after spending nearly $3,000 on a dentist prescribed oral appliance that broke after a few short days of use. 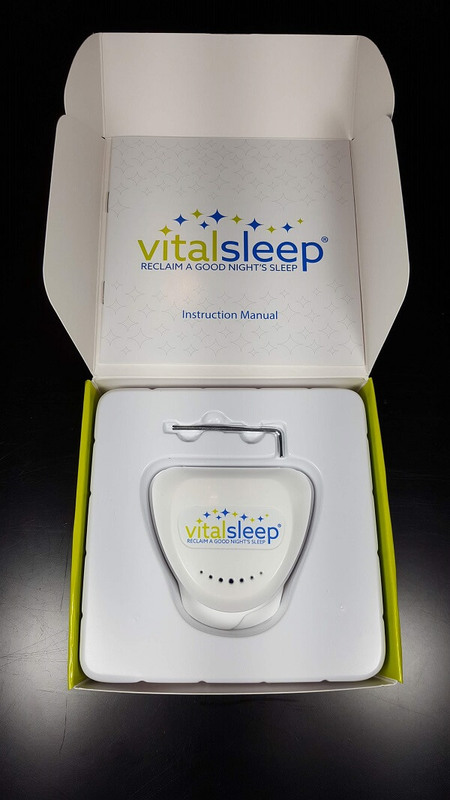 Vitalsleep’s original design was used between 2010 and 2018. 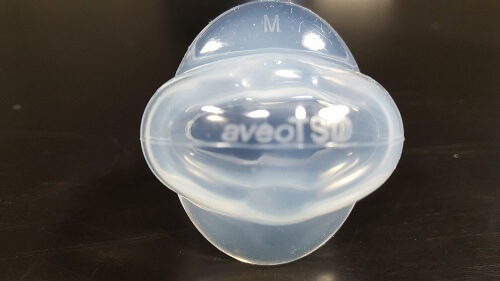 In 2018, a new and improved version was released which drastically improved the fit of the mouthpiece. The new design is also more durable which means that it will last longer. 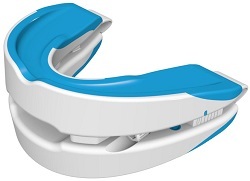 Unlike its opaque predecessor, the new Vitalsleep is solid white with a blue accent color and has a lower profile. The new VitalSleep sports a rigid frame with a soft plastic lining that can be heated to create a deep custom impression of your teeth. This was not possible with the original version. 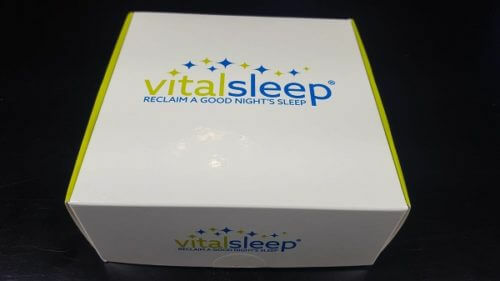 VitalSleep costs $59.95 which includes Free US shipping when you use promo code FREESHIP. The total cost, including standard shipping and the discount, is $53.95. You can request next day or two-day shipping for an additional fee of between $20 and $40. International shipping rates are $7.95 and transit time is typically between five to ten days, although it often arrives sooner. All orders ship the same business day if placed before 3 PM eastern time. You will receive a shipping confirmation with a tracking number once your order ships. Something else to keep in mind is that Vitalsleep offers free replacements for one full year. One thing unique about the VitalSleep is that it’s available in both regular and the small sizes. The small is a scaled-down version of the regular and is 90% it’s size. 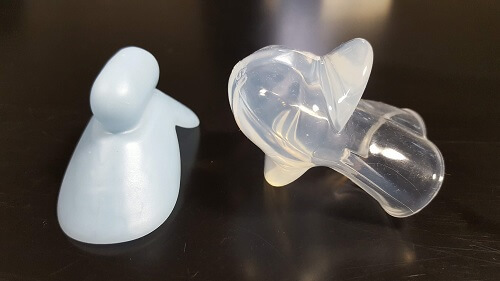 Most snoring mouthpiece manufacturers only offer one size, so having a mouthpiece for those with a smaller mouth is a nice feature since some mouths will be smaller than others. I received my VitalSleep in the mail and read over the instructions. Creating a custom impression only took a few minutes and afterward I used the provided hex tool to adjust the lower tray. Here’s are the steps that I followed during the initial fitting process. Ensure that the upper and lower trays are both adjusted directly on top of each other. If not, use the adjustment tool to move the lower tray in or out. There is an indicator mark on each side of the device. Makes sure that the indicator mark is located all the way forward. Bring a pot of water to a slow boil and submerge the mouthpiece using a pair of tongs. Allow the mouthpiece to sit in the boiling water for 90 seconds. This will make the plastic lining pliable. Remove from the water and dip into a mug of cold water for 3 seconds. Locate the triangle stamped on the inside of the mouthguard. This indicated the upper tray. Place the device in your mouth with the correct side up and bite down gently. Hold this position for 30 seconds. Remove from your mouth and place back into the cold water for 30 seconds. to cool it. Check to ensure a good fit. Repeat if necessary to achieve a deep impression. The entire process was really easy and only took a few minutes. I was able to achieve a great fit on my first attempt. Having owned both the original Vitalsleep as well as the improved version, I have to admit that the newer design fits much better and is more comfortable to wear than its predecessor. The newer one, however, offers a much closer, tighter fit. After fitting, I put the mouthpiece in and I was off to bed. The following morning I asked my wife if she noticed if I had snored any throughout the night. She noted that although it didn’t completely eliminate my snoring, it greatly reduced it. Using the provided tool, I tightened down each side evenly 2.5 revolutions on each side in order to advance the lower tray. The theory is that doing so will hold the jaw forward which helps to clear the airway. The following night, I had my wife observe my snoring habits once again. This time my snoring had completely stopped. I continued to wear the Vitalsleep for the next five night to ensure that I did not experience any issues with the mouthpiece, which I didn’t. The Vitalsleep worked and it worked well. It fits nicely and functioned as intended. What Are The Other Reviewers Saying? As with most MAD’s, some users have reported jaw soreness during the first few nights of use as well as occasional drooling. Aside from these two issues, most reviewers agree that they experienced a complete night of uninterrupted sleep, more energy, and absolutely no snoring the entire night. I was unable to find any complaints of long-term discomfort anywhere online. Those who have tried the improved version of the Vitalsleep mostly agree that it offers a close, tight fit. I found a few who claimed that the unit can be difficult to clean due to all the nooks and crannies in between the two trays. 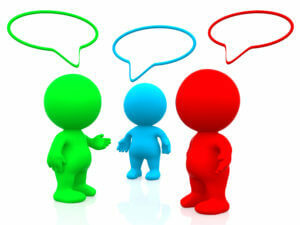 On average, most reviews are coming from people who have purchased and used the product for several months. 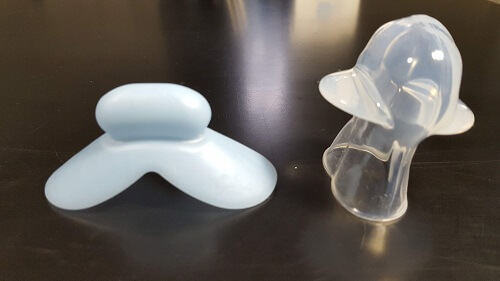 While the Vitalsleep has not been clinically tested, similar devices have and the results indicate that such devices are effective at treating moderate to severe cases of snoring. There are numerous documented studies such as this one conducted by the Department of Thoracic Medicine at Middlesex Hospital in the UK. The study concluded that 80 out of 94 (85%) of patients who completed the study had shown improvements in snoring. While the study did not use the Vitalsleep, the oral appliance that they used functions exactly the same. 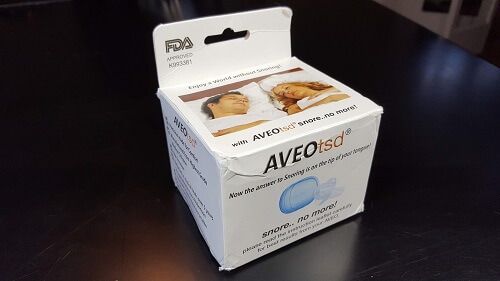 Keep in mind that the most anti-snoring mouthpieces that are available on the market today were not tested using a clinical study. These types of studies can be very expensive and time-consuming. Because of this, manufacturers often rely on studies that were previously conducted using similar mouthpieces. Overall, I was really impressed with the VitalSleep. It is without a doubt one of the best-engineered mouthpieces out there. It allows you to breathe freely, is comfortable and adjustable, and most importantly it works! The VitalSleep packs a hard punch, offering features that are superior to most over-the-counter mouthguards in its class. 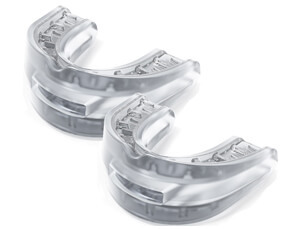 Having the ability to be customized and adjusted the mouthpiece allows for a more comfortable fit. 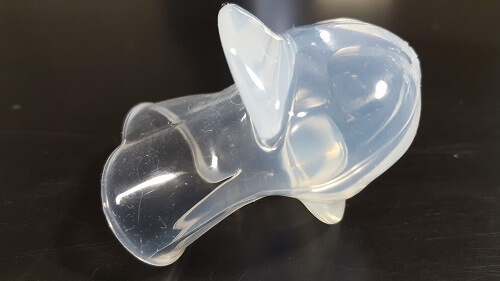 It also features breathing holes which are needed for those with sinus issues because it gives them the ability to breathe through their mouth while sleeping. It’s priced competitively and is one of the least expensive adjustable MAD’s available on the market today. Vitalsleep offers a 60-day money back guarantee free replacements for one full year, for any reason. The VitalSleep hit the nail on the head when it comes to design, price, comfort, and functionality and because of this, I can give it my recommendation. In 1962, Jim Buckwalter created a white noise machine to help his wife who suffered from insomnia. The idea originated when Jim noticed that his wife, Trudy, seemed to sleep better while traveling and staying the night in a hotel room. After giving it some thought, the couple theorized that the soothing sound of the hotel air conditioner was the reason behind Trudy’s improvement in sleep. After realizing this, Jim decided to build a machine that replicated the sound produced by the hotel air conditioner. 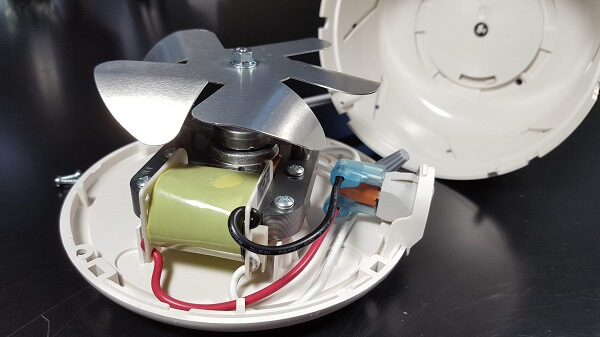 Working in his garage using a few components such as a motorized fan and bowl, he created what would later become the very first white noise machine. Soon enough, friends and family began asking Jim if he could build a white noise generator for them as well. As you may have guessed, this eventually evolved into the creation of Marpac. The sound conditioner that is sold by Marpac today operates using the same basic design as years past with a few minor changes to its appearance. Today, Marpac offers four different types of sound machines including natural sound, multi-sound, baby, and travel. There are a total of eight different models to choose from. I had the opportunity to review one of their most popular models, the DOHM Classic, which is part of their natural sound machine collection. The DOHM classic is available in three different colors including black, white, and tan. This compact unit measures only 5.8″ around by 3.2″ tall which takes up very little space. The unit plugs into a standard US 120v wall outlet and uses just 18 watts of power which is about the equivalent of one LED light bulb. Each unit is made in the U.S. in Wilmington, NC and is signed by the factory worker who assembled it. The Dohm comes with a one-year factory warranty which covers parts and workmanship. Your curiosity might have you wondering exactly what’s inside the Dohm. I removed the cover to take a peek. Please note, opening the unit will void your warranty and puts you at risk for injury or death. Do not attempt this at home. As suspected, there’s really not much to this unit. A power cord runs to a switch and then to a motor which has a metal fan attached to it. The fan blades are folded down at a sharp angle which draws air in from the top and forces it downward. The motor inside seems to be of good quality. Because of the simple design, there are fewer parts that can break which means you should be able to enjoy it for many years before having to replace it. A toggle switch allows you to adjust the fan speed between “Off” “High” and “Low”. The sound of white noise is generated by a fan that’s controlled by this switch. The high-low settings allow you to adjust the noise level or volume of the unit by increasing the speed of the fan. Once turned on, the slide adjustments allow you to tune the machine to achieve the desired level of sound. As you turn the shell clockwise, the opening in which air flows becomes smaller and the sound becomes more muffled. Turning the top of the machine creates a similar effect, although the change in sound is not nearly as dramatic. This unit is capable of generating a range of sound between 50 – 75 decibels, which is the equivalent of moderate rainfall to traffic noise. The Dohm did not arrive with any instruction aside from “plug it in”, “turn it on”, and “adjust your sound”. Honestly, this is a very simple device, so further instruction is not necessary. I adjusted the side holes to my liking and then fine-tuned top holes. It took a few attempts to find a sound that was soothing yet not distracting. I started off by testing the Dohm in my office where the sound of traffic coming from outside can be quite distracting at times. I placed the unit next to my office window and turned it on low. I quickly realized that the sound being generated was not quite enough to drown out the traffic noise, so I turned it up to high. At this point, the sound was a bit too loud, so I dialed the machine down a bit to muffle the sound until it reached a balance where I could no longer hear the passing traffic and the white noise was not overly loud. The gentle whispers of the Dohm allowed me to work for hours without the distractions from outside noise. It also helped to eliminate noise from outside my office door. I found that placing it next to the door is a great way to keep a conversation private from those who pass by. While having too much noise can be an issue, a room that’s too quiet can be difficult to sleep in. The sound of silence can make falling asleep a challenge and the slightest noise can be startling. I usually sleep with the fan running, which generates enough noise to allow me to fall asleep. One of the issues with running the fan is that depending on the temperature of my room, I don’t always want the fan blowing on me. The Dohm is the perfect solution for this issue because it allows me to enjoy the sound of air movement but without actually feeling it. As a bonus, it uses less energy than a ceiling fan. My bedroom is generally very quiet, with the exception of my snoring, which I hear can be very loud at times (more on this in just a second). I placed the Dohm on my dresser and turned it on low and then adjusted the sound to create a low soothing whisper. I was amazed at how the sound filled the room even with it turned to low. Once I was settled into bed, it wasn’t long before I was sound asleep. Not only did I fall asleep quickly, I stayed asleep throughout the night which is uncommon. If you are a regular reader of Snoringmouthpieceguide.com, you know that I have a snoring problem. In fact, my snoring actually inspired me to create this blog in a quest to find the perfect snoring mouthpiece. 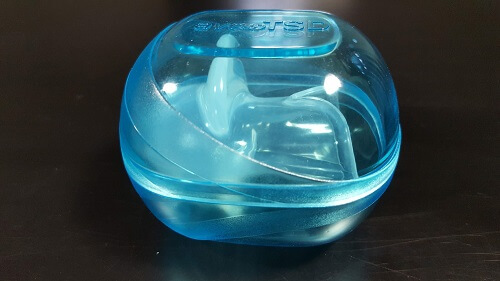 These retainer-like devices can actually completely silence the sound of snoring by addressing the root cause. 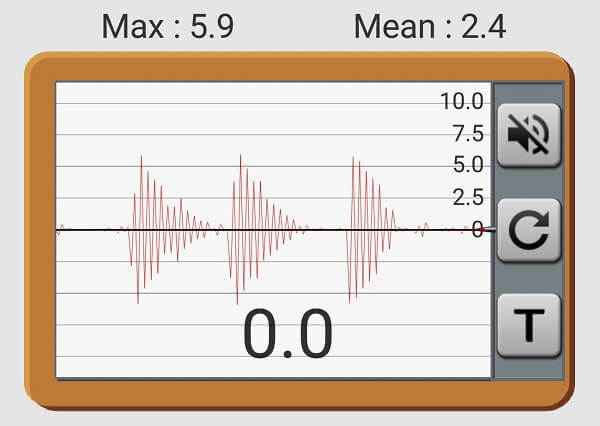 In the past, I’ve written about using white noise to neutralize the sound of snoring and have heard from many people who have experienced success using white noise to silence their partner’s snoring. This, however, was my first attempt at using a sound generating machine to combat my snoring. I positioned the machine on my nightstand and turned it on low before going to bed. I left it up to my wife to adjust the Dohm once I fell asleep. As expected, the low setting was no match for my loud snoring, so my wife eventually turned the machine up to high and opened the air holes nearly all the way. With the machine cranked up and humming away, the Dohm overcame the sound of my snoring and she was able to fall asleep. The next day, my wife placed the Dohm on her side of the bed and placed a pillow between us which helped to reduce the noise traveling over to her side of the bed. By doing so, she was able to lower the fan from high to low and still fall asleep without being disturbed by my snoring. The Dohm was a success. The Dohm Classic varies in cost, depending on which retailer you purchase it from. Bed Bath & Beyond and Target currently sell the machine for $49.99 while Walmart sells it for slightly less. As for the best price, I found that purchasing from the Marpac website is the way to go. They currently sell the Dohm Classic (M1DSUSWH) for $44.95 which includes free FedEx shipping within the United States. Plus, when you purchase directly from Marpac, you can take advantage of their 101-night Trial which allows you to test out the Dohm for 101 nights and return it for a refund if not satisfied. Use the button below to purchase it from Marpac. 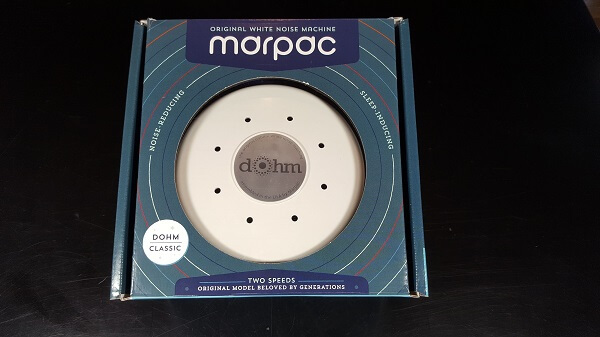 Marpac sells three natural sound machines – The Dohm, Dohm Classic, and the Dohm Uno. While the three are similar in appearance, there are subtle differences between each. The Dohm classic is the original version of the sound machine which has been sold for over 50 years. In 2017, Marpac decided to give their sound machine a facelift. In doing so, they changed the name of the original version to Dohm Classic while calling the new version the Dohm. While the two are identical in function, there are a couple of differences between the Dohm and the Dohm Classic. First, the overall textured design of the Dohm is a bit sleeker and more modern. While the Dohm Classic comes in the colors black, white, and tan, the Dohm comes in white with several accent colors as well as charcoal. Aside from the appearance, the newer version costs $5.00 more. I speculate that MarPac is phasing out the classic version and moving towards replacing it with the newer one, so if you are interested in the classic, right now is a great time to pick one up. The Dohm Uno is slightly larger than the classic and features an on/off button with no option for high or low, which will limit your ability to control the sound level. 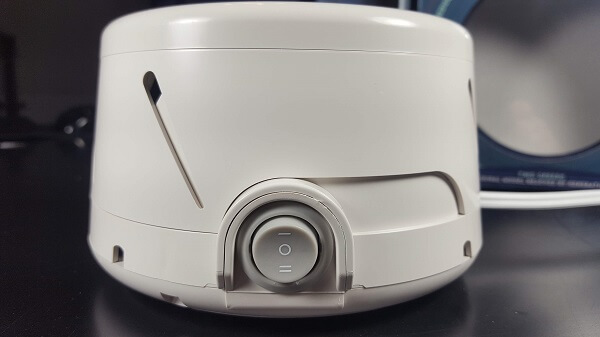 The Uno is only available in white and costs $15 less than the Classic Dohm. Although there are plenty of white noise machines to choose from, the Dohm Classic is the oldest and most popular machine out there and for good reason. 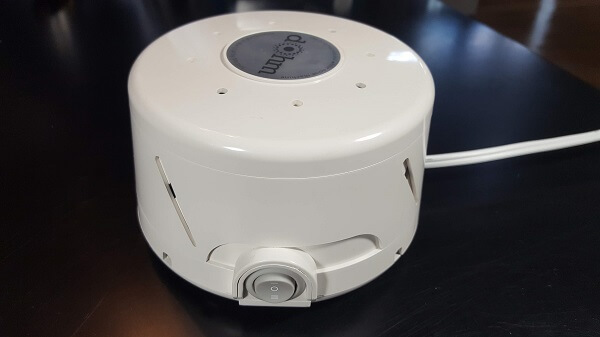 While other sound machines offer more features than one could ever use, the Dohm provides soothing white noise using a 2-speed fan in lieu of speakers. Because of its mechanical working, it provides smooth, continuous sound without any noticeable loop that can be heard. The simplicity of the machine and the purity of the sound that’s produced are likely two reasons why the Dohm has been around for so many years. Before trying the Dohm Classic, I never realized just how useful a white noise machine could be. Now that I own one it’s hard to imagine living without it! These days, the Dohm remains on my wife’s nightstand and is running every night. I sleep better listening to the sound of soothing white noise while she’s able to fall asleep peacefully without having to hear my snoring. Aside from bedroom and office use, the Dohm can help children, as well as infants, sleep since white noise can be very soothing. Marpac even has a sound machine that’s specifically designed for babies. The Dohm is versatile and can be helpful for anyone who is looking to drown out noise, whether it’s a loud neighbor, traffic, or a husband that snores. The Dohm classic is one product that I can wholeheartedly recommend. 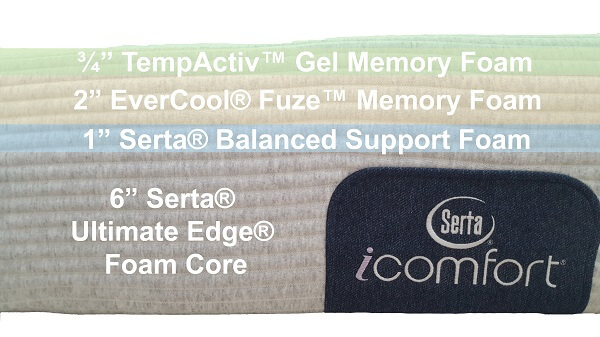 The Serta iComfort foam series is the latest offering by Serta, the number one American mattress manufacturer. 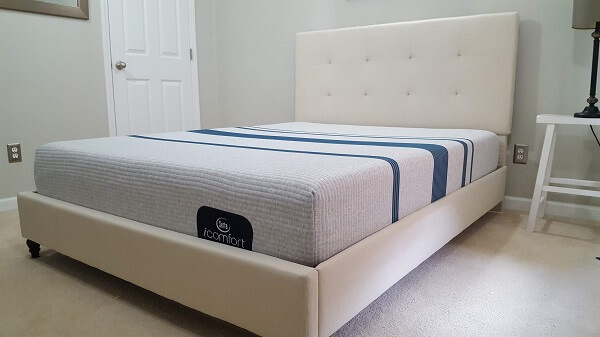 The iComfort is sold in several different levels of firmness including firm, cushion firm, elite luxury firm, gentle firm, plush and elite plush. The “Blue” collection is the least expensive of the iComfort series and is only offered in firm and gentle firm while the “Blue Max” is more expensive, offered in four firmness levels, and is made with more innovative materials. 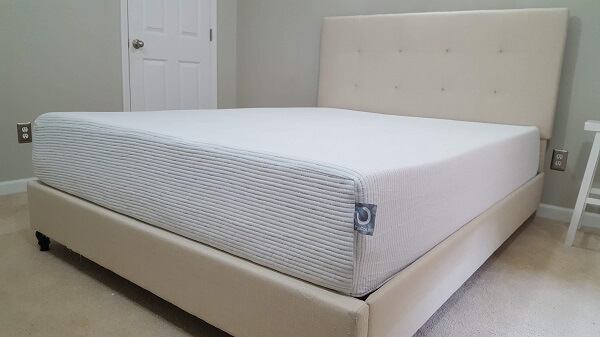 In this review, I will be examining the Blue 100 Gentle Firm mattress, which is the least expensive of the six available options. This mattress has a firmness that’s somewhere in the mid-range – not too soft yet not too firm. The Blue 100 is a four-layer viscoelastic mattress that measures approximately 9 3/4″ in thickness. It’s available in all sizes ranging from Twin to California King. Serta claims that this mattress offers enhanced breathability to keep you cool at night, superior pressure relief, and great support. How true are these claims? 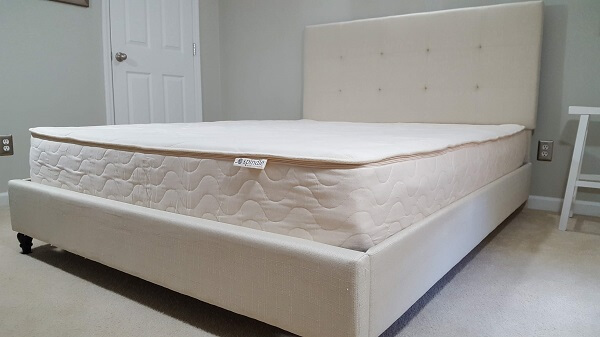 During this review, I’m going to walk you through what it’s like to own this mattress, discussing everything from shipping and arrival to motion isolation as well as the heat dissipating properties of this mattress. Go ahead and grab a cup of coffee, this is going to be a long one. Although the Blue 100 is a viscoelastic foam mattress, Serta doesn’t deliver it compressed and rolled up like most foam mattress companies do. 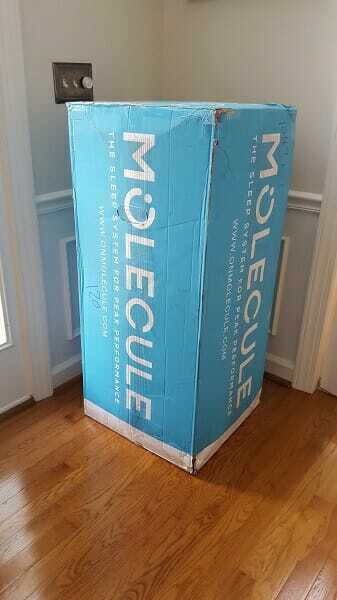 Instead, it arrives full-size and encased in plastic. Due to the size and weight of this mattress, Serta uses a logistics company called MDX who provides white glove delivery. The day before the delivery date, I received a phone call from the delivery company confirming a delivery time frame. 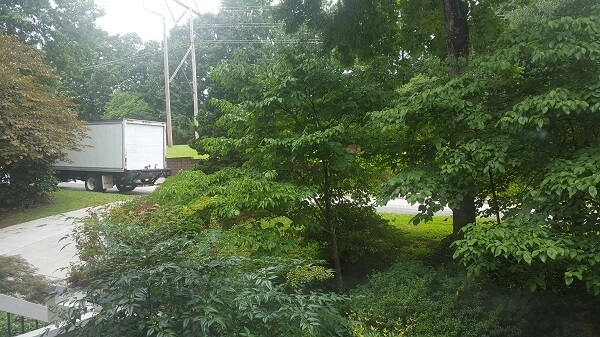 The next day, the delivery truck was in route and I was able to track it using the delivery services website. The tracking showed an estimated delivery time as well as which stop the truck was currently on. The mattress arrived on time and was delivered inside of my home by two gentlemen who offered to move it wherever I wanted. The entire process was smooth and couldn’t have been easier. I chose to leave the mattress inside the protective plastic until I was able to get around to reviewing it. Removal of the plastic and disposal is, however, part of the white glove delivery service that comes standard as is setting up the bed. Once ready, I cut and removed the plastic cover from the mattress and it put it to use. I must admit, it was nice not having to wrestle with unboxing a compressed mattress and then disposing of the box and plastic wrapping. This one required no unboxing, time to decompress, or assembly. From the moment that it arrived, it was ready to sleep on if so desired. Nearly all new furniture that contains foam will produce some off-gassing which is usually noticeable within the first few days that it enters your home. Think of it as the smell of the inside of a new car. As the mattress airs out, it becomes less noticeable and eventually disappears. 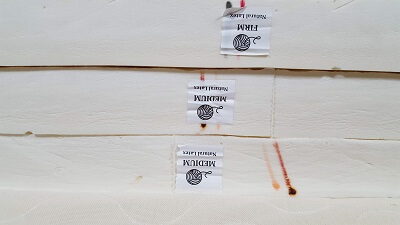 Boxed mattresses that are compressed into an airtight roll will produce more off-gassing when unpacked than those which were not because they don’t have an opportunity to air out prior to shipping. Serta participates in the CertiPUR-US program which means their foams are tested and contain low Volatile Organic Compound emissions, or VOCs, which are responsible for the that “new” smell. In order to become certified, the foam must contain less than 0.5 parts per million of VOCs. This is a very minimum amount. The first test that I perform is rather simple and involves describing how the mattress smells. After removing the plastic cover from the mattress, I didn’t notice much of a smell at all. In order to detect any scent, I had to bury my face in the mattress. Only then did I detect a faint smell that was not at all offensive. It didn’t make me gag or choke as I have before with other mattresses which are often not CertiPUR certified. 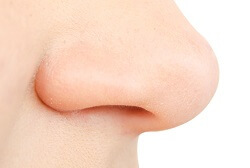 Within the first couple of days, the faint smell had dissipated and was no longer detectable. While older foam mattresses have been criticized for trapping body heat, newer foam technology now offers a cooler sleeping experience than the mattresses that came before. The Blue 100 uses two layers of specialty foam to combat body heat. First, the top layer contains 3/4″ of TempActive Gel Memory Foam which is a gel-infused foam that’s specifically designed to carry heat away from the body. This viscoelastic material not only cools but also provides pressure relief. The second layer is a 2″ layer of EverCool Fuze material that offers a supportive feel along with a cool, plush touch. Between the two layers, there’s a combined total of nearly 3″ of cooling foam. While all of this sounds great, you are probably wondering exactly how cool this mattress sleeps. Aside from sleeping on the mattress and offering my opinion, I also conducted a heat dissipation test to give you a better idea of the cooling properties of this mattress. For this test, I heated a large rice sack in the microwave for two minutes and then placed it on top of the bed. I let it rest for several minutes to allow time for the heat to transfer. After 10 minutes, I removed the rice sack and measured the temperature drop during the two minutes that followed using an infrared thermometer. Check out the results below. 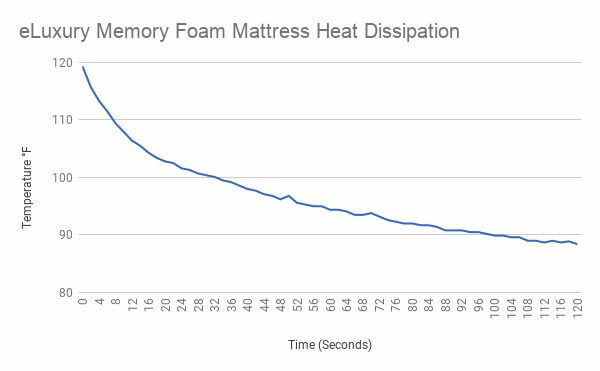 As you can see, this mattress lost a significant amount of heat during the first twenty seconds of the test and continued to cool down at a steady rate for the remainder of the testing period. The iComfort started out 124.4° and cooled down to 94.4°, a loss of 30°. When compared to other foam mattresses, the cooling properties of this one are excellent. While sleeping on this mattress, both my wife and I agreed that it sleeps very cool and did not trap heat. Firmness can be described as the feel of a mattress when you lay down on it. Firmness will vary based on the density and ILD rating of the foam that’s used inside of the mattress. Using foams with a higher ILD base layer will provide a firmer mattress. Serta considers the iComfort Blue 100 to be a “gentle firm” mattress. While mattress firmness is a matter of personal preference, most back sleepers, as well as some side sleepers, will find a firmer mattress to be comfortable while stomach sleepers often choose a softer mattress. Also, those who are heavier typically choose a firmer mattress that can provide more support. 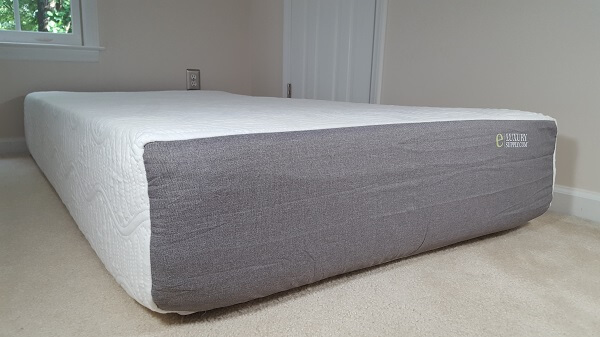 In order to demonstrate the firmness of this mattress, I simply placed a 42 lb weight on the surface of the mattress and use a ruler along with a straight edge to measure the drop. In this case, I used a bucket that has been filled with 42 lbs of concrete as a weight. The test showed that the mattress compressed 2″ with 42 lbs of weight over an area that’s 8.5″ in diameter. Comparing this to other medium-firm mattresses that I’ve tested, I agree with Serta’s rating. While the firmness of a mattress describes how it feels, it doesn’t say much about its support. It’s a common misconception that a mattress with a firm feel will provide better support than a mattress with a softer feel. While there can be a correlation between the two, mattress firmness and support are two characteristics that should be examined independently. Mattress support can be viewed as how well the mattress relieves pressure in key areas while maintaining proper posture. If a mattress sinks in at the middle and causes the body to bow, it doesn’t provide proper support. When laying on the mattress, I asked my wife to observe the alignment of my body. Her opinion was that my body remained flat and appeared in line. When sleeping on this mattress, my body felt great in the morning with no noticeable aches or pains. Mattress recovery refers to how fast the mattress returns to its original shape after being compressed. Some foam takes seconds to respond when weight is removed while other foams respond nearly instantly. A mattress with a slow recovery can leave you feeling stuck inside and unable to roll over or get out of the bed. While some sleep in one position throughout the night, others have a tendency to toss and turn throughout the night. A slow recovering mattress can be problematic for active sleepers. To get an idea of how this mattress responds, take a look a the video below. As you can see, the base layer of the mattress responds fairly quickly while the top layer of foam gel material responds with a slight delay. When sleeping on the mattress, I was able to roll over and change positions without experiencing the feeling of being stuck in the mattress. Motion isolation or motion transfer refers to how well the mattress localizes motion. In the case of two people sleeping in the same bed, how well does the mattress prevent the other person from feeling movement? This is something to consider if your partner is an active sleeper and moves throughout the night. Fortunately, foam mattresses, in general, have good motion isolation qualities as they do not contain coil springs which can transfer motion. To test the motion isolation properties of this mattress, I placed a wine glass on top of the mattress and dropped a 14 lb weight from a distance of 12″ and repeated the test three times. I also used a vibration meter to measure the movement of the mattress. The results of the test are shown below. As you can see in the video below, there’s very little movement in the glass and it does not appear to come close to tipping over. 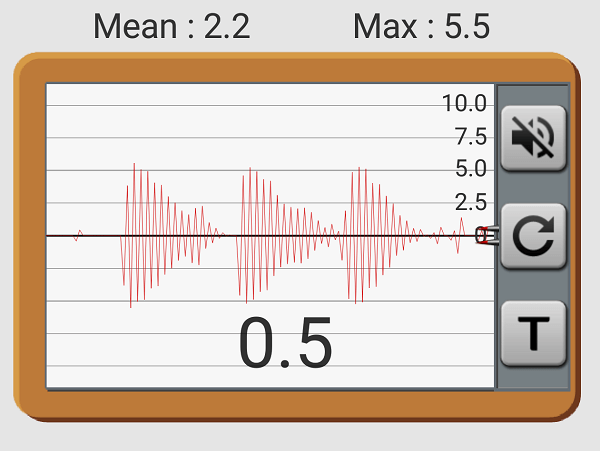 The vibration meter showed a max reading of 5.9 MMI and a mean of 2.4 MMI, which is fairly low. The edge support of a mattress can be important, especially if you are sharing the mattress and need to take advantage of the entire surface area of the mattress. A mattress with poor edge support may cause you to roll off of the bed if you lay too close to the edge. A firmer edge will support your weight, regardless of your position on the mattress. When laying close to the edge of the iComfort mattress, I did not experience the feeling of being ejected from the bed. When sitting on the edge, I did sink down some but remained elevated well above the mattress platform. Odds are, you have already heard of Serta mattresses. After all, they are the largest mattress manufacturer in the United States and sell a variety of different types of mattresses including traditional innerspring, memory foam, hybrid, and even a latex collection. The company was formed in 1931 as Sleeper Incorporated and has since been restructured and changed hands several times. Today, Serta International operates as a subsidiary of Serta Simmons Holding LLC, based out of Atlanta, Georgia. Serta prides itself in both designing and manufacturing their mattresses in the United States. This is something that not all mattress companies can claim as an increasing number are producing overseas. Serta operates 36 manufacturing facilities in the US as well as one in Puerto Rico and five in Canada. Serta offers a large collection of mattresses including the Perfect Sleeper, iComfort, Mattress in a Box, Sertapedic, Hotel Mattresses as well as an exclusive collection which includes the iSeries Hybrid and the Bellagio at Home. The Blue 100 is made using four layers of foam and is wrapped in a proprietary cool-to-the-touch cover. Let’s take a closer look at what’s inside of this mattress. The comfort layer contains two layers of memory foam with a combined thickness of 2.75″. First up, the TempActiv Gel Memory Foam which is 3/4″ thick and is a layer of memory foam that’s infused with cooling gel beads. The purpose of this gel is to absorb body heat and dissipate it away from the mattress in order to keep your body cool. Just beneath the TempActive layer is a 2″ layer of EveryCool Fuze Gel Memory Foam. The purpose of this layer is to help promote the movement of air while providing pressure point relief. As we all know, memory foam can trap body heat and leave you sleeping on a hot and uncomfortable mattress. This layer also contains a bit of gel and is designed to allow air to flow freely between the TempActiv Layer and the transition layer. In order to create a smooth transition between the comfort layer and support layer, Serta used a 1″ slab of Balanced Support Foam. This layer offers support without compromising comfort. All mattresses need a support layer. Without one, you will experience poor sleeping posture which can affect the way your body feels in the morning and throughout the day. Beneath the transition layer, Serta uses a 6″ layer of Ultimate Edge Foam Support Core which supports the body in order to provide the best night sleep possible. Although not disclosed, this layer typically has a high ILD rating. One unique feature of this layer is its edge support which helps to keep you on the bed when you lay close to the edge. Some foam mattresses will literally throw you from the bed if you roll over. Having a good edge support is helpful if you plan to share your bed with another person. 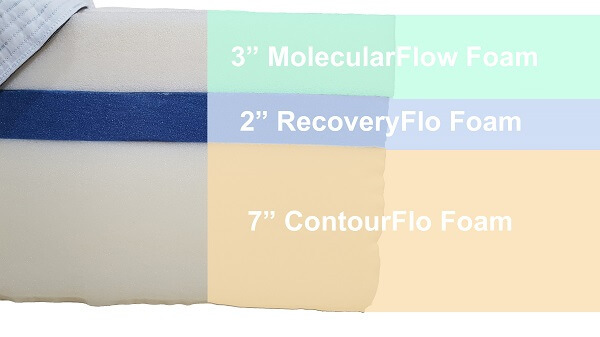 The iComfort mattress comes in six different firmness levels which will vary depending on the model that you choose. If you want to go with their firmest mattress, the Blue 300 fits the bill. The Blue Max 100 is the next firmest mattress followed by the Blue Max 5000. From there, the Blue 100 model begins to cross over to the softer side followed by the Blue Max 1000 Plush and then the Blue Max 3000 Elite Plush, which is this softest mattress that they offer in this series. Each mattress in this series varies in price and construction. The mattress featured in this review is the Blue 100 and is a medium-firm mattress which is not too firm yet not too soft. The Blue 100 comes with a 10-year limited warranty that’s similar to other mattresses in the industry. Body impressions or sagging greater than .75″ are covered with this warranty. They do ask that the bed is properly supported, meaning it must have a center support along with at least five cross slats. The center support must have legs that extend down to the floor. The warranty does not cover items such as comfort preference, damage due to abuse or misuse, tears, burns, stains, soiling, mattress fabric, zipper damage due to improper care, normal change in firmness or impression less than 3/4″. There’s nothing that really stands out about this warranty as it’s almost identical to the majority of mattress warranties out there. The price of the Blue 100 varies according to the size that you choose. Prices start at $659.00 for the Twin and go up to $1,599.00 for the California King. Perhaps the most popular, the queen, sells for $1,099.00. Free white glove delivery is included with all orders. White glove delivery simply means that two people will deliver the mattress, carry it up to two flights of steps, unpack it, set up the mattress and remove debris as well as the old mattress if you desire. Heres a chart showing each size mattress and the cost associated with it. Serta does offer the iComfort credit card which gives you the ability to pay the mattress off with 0% financing over sixty months. This offer is only available to qualified buyers. Any balance beyond the 60 month period will be charged 29.49% APR. This credit card has no annual fee and special financing is only available for Serta purchases. The iComfort series does come with a 120-night in-home trial that allows you to try out the mattress in your home before deciding to keep it. Serta does ask that you sleep on the mattress for a break in period of at least thirty nights. This will allow your body to adjust to the new mattress. Anytime between 30 days to 120 days you are able to contact their customer support and request a refund or choose another mattress. Serta does deduct $200 from the initial purchase price for shipping and handling. They also charge a 15% return and disposal fee, since the mattress will no longer be sellable after use. Choosing on a mattress may seem like an impossible task with so many options. One way to narrow down your list is to choose a mattress that’s made by one of the oldest and most trusted names in the industry. While the iComfort is one of the newest mattresses to hit the market under the Serta name, it was created by a company that has been in the mattress business for over 80 years, unlike many of the newer startups which offers a “white label” product that’s made by another manufacturer. The Serta iComfort Blue 100 is an outstanding mattress that is reasonably priced and has everything that you would ever want in a foam mattress. This mattress remains cool and comfortable throughout the night while delivering excellent pressure relief and support. This mattress is responsive yet does an excellent job isolating motion. Although it’s a foam mattress, it does a great job dissipating heat, due to the layers of patented gel memory foam. Overall, this is one mattress that I would recommend to anyone who would like to try a foam mattress. Some people enjoy sleeping on a firmer mattress while others like their mattress a bit on the softer side. If you share your bed with a partner, there’s a good chance that the two of you have different preferences when it comes to mattress firmness. The issue is, nearly all mattresses come with the same comfort level on both sides. If you like a firm mattress while she prefers a medium soft mattress, you are faced with the decision of choosing one mattress over the other or compromising by choosing a mattress with a comfort level that’s somewhere in the middle. Either way, one or both partners may end up sleeping on a mattress that they are not comfortable with for the next 10 or more years. To further complicate matters, many foam mattress retailers these days are using a one-size-fits-most approach, offering their mattress in one “universal” firmness level which is typically in the medium range. In order for all to be happy, both partners must enjoy the same firmness level and it must be the universal firmness level chosen by the manufacturer that you decide to go with. It’s easy to see how this can be problematic. Morphiis has come up with a solution to this problem. They offer a mattress that allows you to customize each side to create a personalized sleep experience for both you and your partner to enjoy. 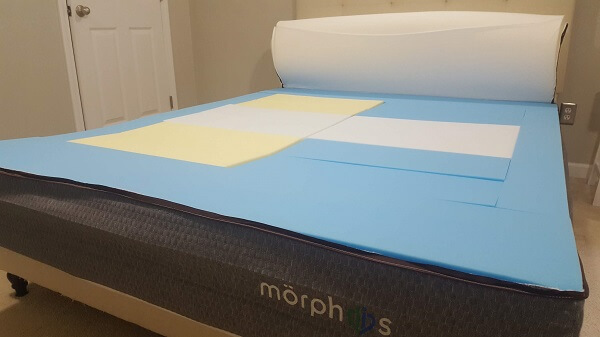 The concept of a customizable mattress seems very interesting so I was more excited than ever to give the Morphiis a try. Throughout this review, I’m going to share my experience with Morphiis and walk you through what it’s like to own one. By the end, you will know if this mattress is something that might be a good fit for you and your partner. 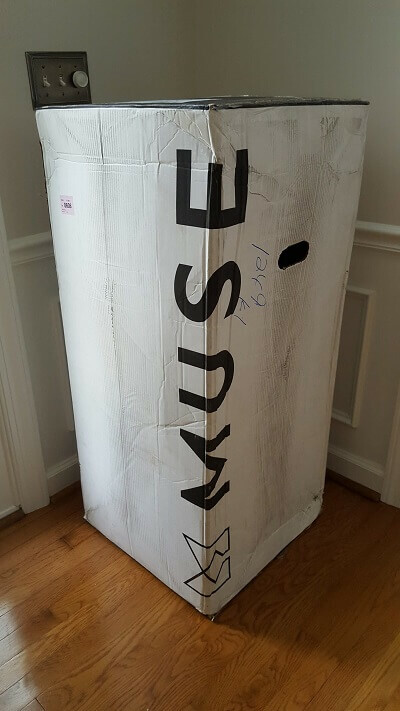 Unlike most press and roll mattresses that come in a box, my queen size Morphiis arrived in a cylindrical bag, measuring 58″ long X 17″ in diameter and weighing approximately 79 lbs. The mattress was shipped via UPS ground service and took 5 days to arrive from East Petersburg, PA.
At nearly 5′ in length, the bag was rather tall and heavy which meant that it required the help of my wife to carry it upstairs into the bedroom. Once there, I removed the blue bag that covered the mattress and laid it out on the bed. The package came with some instructions as well as a letter opener which is used to slice through the plastic that holds the mattress together. Using the opener, I cut through the plastic and the bed sprung open. 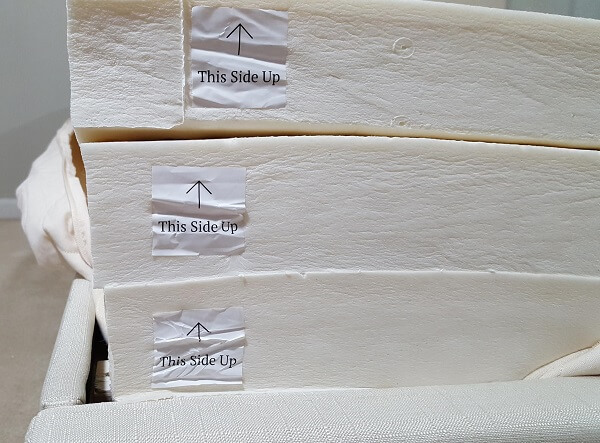 The “medium” inserts were packaged inside the bed while the “soft” and “firm” inserts were packaged outside of the mattress. Two insert storage bags were also included inside the package. After unpacking everything, I let the mattress and foam sit overnight to ensure that it was fully expanded. Morphiis suggests giving the mattress up to 24 hours to fully expand. After doing some reading, I determined that the medium arrangement sounded like it would be the best fit for myself. My wife decided that the soft may suit her needs better. I arranged the mattress with all soft (yellow) on her side and all medium (blue) on my side. I then zipped up the cover and we slept on the mattress for the next 3 nights. While we were both satisfied with the feel of the mattress, we decided to rearrange a few areas to find the optimal arrangement. I decided to swap out the midsection area for the firm (white) inserts while my wife swapped out the same area, also using the firm inserts. Laying down on the bed, be both could feel an immediate difference in support. At this point, we agreed that this arrangement was perfect for each of us and kept it in this arrangement. Foam mattresses have a tendency to give off an odor when they are unwrapped and begin to air out. This odor is caused by what’s known as off-gassing where Volatile Organic Compounds (VOCs) are released into the air. Nearly all new products off-gas to some degree. Off-gassing becomes an issue when the smell is overpowering and lasts for a long period of time. Morphiis is CertiPUR-US certified, which means that off-gassing shouldn’t be much of an issue. As a part of the CertiPUR testing process, VOC emissions are checked to ensure that levels are less than 0.5 PPM. After unpacking a mattress, I always give it the smell test where I put my face into the mattress and give it a whiff. When unpacking the Morphiis, I did notice some “new foam” smell although this odor eventually disappeared after a few days. Choosing a mattress that sleeps cool is a good idea if you have a tendency to sweat at night. Due to the nature of foam, some mattresses have a tendency to trap heat which can make sleeping on them quite uncomfortable. This is especially true when it comes to foams that were made many years ago. The foam used in most mattresses today tend to breathe better due to advancements in foam manufacturing. Morphiis advertises their mattress as having a comfort layer that adapts to your body and enhances airflow. Their outer cover is said to keep you cool and comfortable by promoting airflow throughout the night. 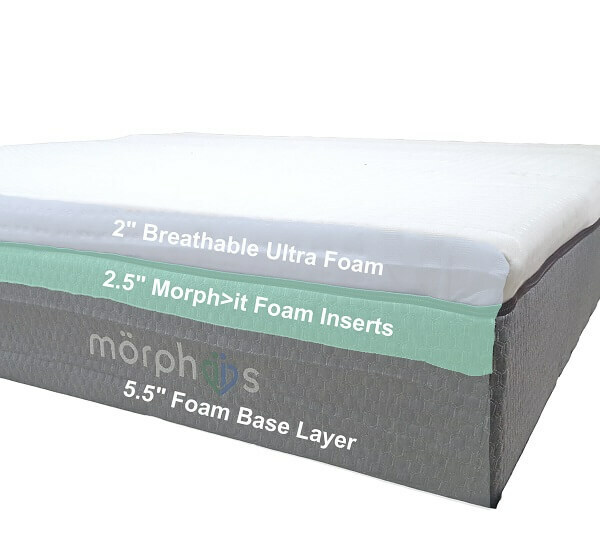 How does the Morphiis measure up to other mattresses? Does it really sleep cool? When sleeping on this mattress, neither my wife or I experienced any issues overheating. In fact, we felt as though it slept fairly cool. 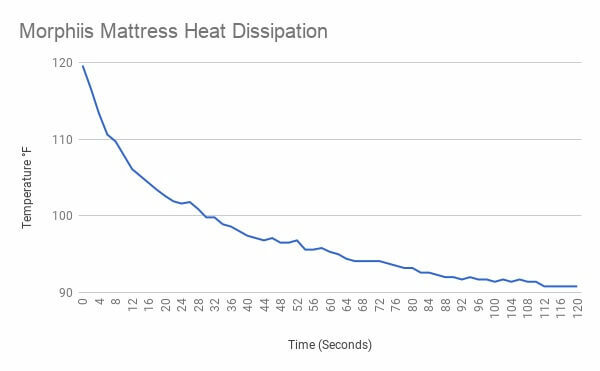 In order to demonstrate the cooling capabilities of this mattress, I conducted a heat dissipation test which shows how well this mattress dissipates body heat. To simulate a person sleeping on the bed, I heated up a large rice bag in the microwave for two minutes and then placed it on top of the mattress. After allowing it to sit and transfer heat for 10 minutes, I removed the bag and used an infrared thermometer to measure the surface temperature of the mattress. At the time of removing the rice bag, the mattress temperature was at 119.6°. Within two minutes, the temperature lowered to 90.8°. During this time period, the temperature dropped an incredible 28.8°. The chart below shows the rate at which the mattress lost heat. As you can see, Morphiis experienced a huge amount of heat loss within the first 20 seconds. From there, the temperature gradually dropped until the last few seconds where it began to flatten. 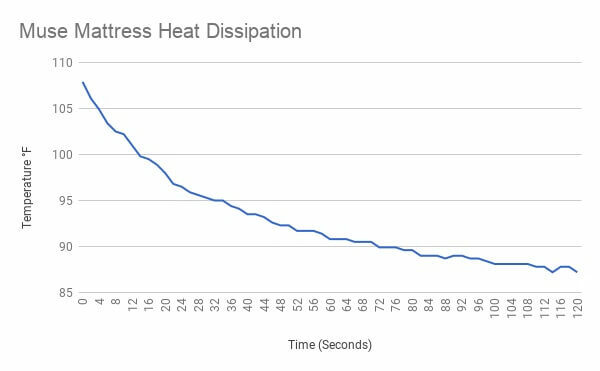 Here’s the video demonstrating heat dissipation over a two minute period. Mattress firmness can be thought of as how stiff a mattress feels whenever you lay on it. Does it feel hard as a rock or soft as a cloud? Perhaps it has a firmness level somewhere in between. In this case, we would refer to the mattress as being “medium”. While the majority of people are okay with a medium firm mattress, others prefer one that’s either softer or firmer. Mattress firmness is a personal preference which will vary from one person to another. 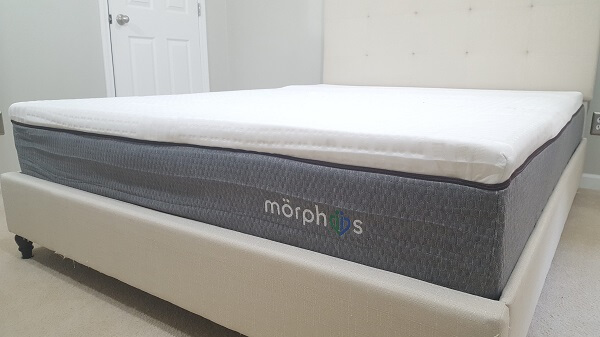 One very distinct advantage of the Morphiis mattress is not only are you able to experiment with different mattress firmness levels, you can also personalize the firmness on your side of the bed. Most beds don’t allow you to adjust the firmness level at all and very few allow adjusting on each side of the bed. Morphiis allows both. To demonstrate mattress firmness, I filled a 2-gallon bucket with 42 lbs of concrete and placed it on the bed. A ruler and straightedge were used to measure the surface drop of the mattress. First, I tested the firmness of the medium inserts and found that the mattress had dropped about 2.25″. I then removed the medium inserts and replaced them with the firm and soft inserts. The soft inserts caused the mattress to drop an additional 1/4″ while the firm brought the weight up 1/4″. 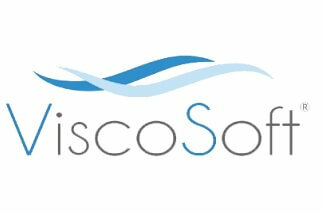 There was a noticeable difference in mattress firmness when comparing the soft to the firm. A mattress can be comfortable yet provide very little support. When this happens, your body will let you know in the morning as you will notice aching and other discomforts. The key is to find a mattress that has the firmness and support that your body needs in order to fully recover and get a restful nights sleep. How can you tell if a mattress properly supports your body? The easiest way is to have a partner or friend take a look at your body while laying on the mattress. If your back bends in the middle, the mattress is not providing enough support. Your posture should be in line and your body should lay flat when laying down in bed. I had my wife observe the alignment of my body while laying down on the Morphiis and she noted that I was using good posture. I had observed her laying posture and found that her body also remained aligned while laying in both the back and side position. Recovery time refers to how fast the mattress bounces back when you remove pressure from it. There are many different types of foam out there and they all respond differently to pressure. Depending on the type and density of the foam, recovery may be nearly instant or could take several seconds. Slow responding foams are generally not a good choice for mattresses because they can leave you feeling trapped as you roll over. A mattress with a fast recovery time is ideal for active sleepers who change positions multiple times throughout the night. In the recovery test, I press down on the mattress several times and then quickly remove my hand so that you can see how fast the mattress responds. As shown in the video below, Morphiis has a very fast recovery time. I had no issues freely moving around this mattress. Motion Isolation or motion transfer refers to the ability of a mattress to localize motion. In other words, when your partner moves, does the entire bed move with them? This is an important consideration if you sleep next to a partner who disrupts your sleep by moving around throughout the night. A night of disturbed sleep will prevent you from getting a proper nights rest and will leave you feeling tired during the day. Some mattresses are better at isolating motion than others. For instance, a mattress with coils that are wired together will transfer a lot of motion while an all foam mattress transfers very little motion. Since the Morphiis is an all foam mattress, I expected it to perform well in this test. To demonstrate motion isolation, I used a water-filled wine glass and a 14 lb weight. 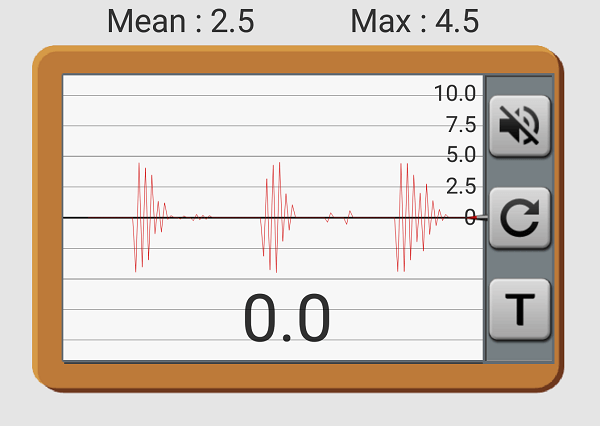 I also measured the vibration of the mattress with a vibration meter app. In this test, I place the vibration meter near that glass and dropped the weight from the opposite side of the bed from a distance of 12″. This test was repeated 3 times. The results show very little movement in the glass. The meter showed a mean reading of 2.5 MMI and a max of 5.7 MMI, which is fairly low. If you are thinking about buying a foam mattress, edge support should be taken into consideration. A low-density foam near the edge of the bed can cause you to fall off if you get too close. If you are sharing your bed with a partner, having good edge support is essential as you may need to utilize every square inch of surface area of the mattress. In order to test the edge support, I start by sitting on the edge. As with most foam mattresses, the edge of the Morphiis did not hold up very well while sitting. When laying in the mattress, I was able to lay towards the very edge without feeling as if I would be tossed from the bed. While this mattress may not be best suited for sitting, it works well for the purpose of laying. My wife and I slept comfortably on the bed without issue. Morphiis is produced by Perfect Pressure LLC, a company based out of Aventura, Florida. The company is headed by Earl Takefman who spent many years leading numerous public companies from across the US. The idea of the Morphiis born from a 5 zone mattress that was introduced by the company as the “Perfect Pressure Mattress”. In 2017, using the original concept of a zoned mattress, Takefman designed and created the Morphiis to address the issue of partners who couldn’t agree on a firmness level as well as to address the issue of those who found their original mattress to be too hard or soft. The Morphiis was the perfect solution that allowed each person to customize their bed exactly how they wanted it. 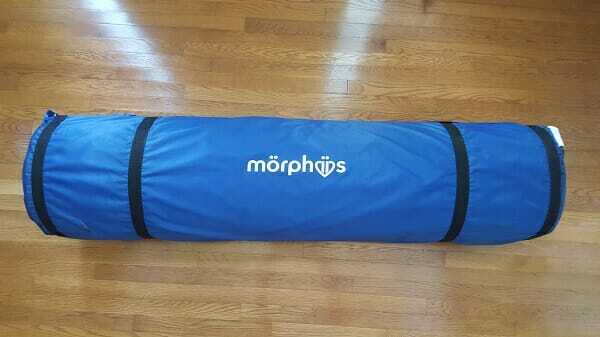 Today, it seems as if the Perfect Pressure mattress has been phased out and the Morphiis is now its replacement. Aside from their mattress, Perfect Pressure LLC also sells a customizable mattress topper as well as a customizable pillow and an adjustable bed frame. The one thing that all of their products have in common is that they are adjustable and customizable which seems to be their focus. Morphiis comes in six standard sizes ranging from twin to California King and is a total of 10″ thick. The basic construction of each mattress is the same, regardless of the size that you choose. Morphiis stresses the fact that their mattresses are made from “ultra” foam instead of memory foam which has a tendency to sleep hot and leave you feeling stuck inside of the mattress. Ultra foam is quick to respond which combats this issue. 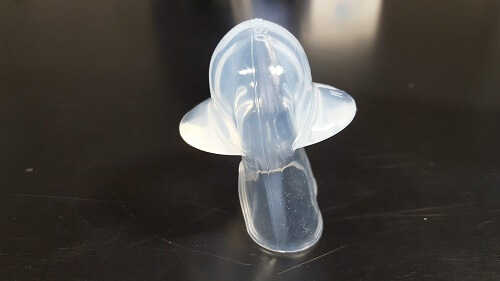 The main portion of the Morphiis includes a 5.5″ thick base layer and edge supports that are joined together to form one unit. This portion of the mattress is made from a high-density foam which offers rigidity and support. The mattress can be laid on top of a box spring, platform, or slatted bed (no more than 3″ between slats). Due to the design of the base, it also works quite well with an adjustable bed frame. Six slots run along either side of the mattress allow you to add Morph>it comfort inserts in the orientation that you desire. All mattresses have a total of 12 slots with the exception of the twin size which only has six. Each mattress, with the exception of the twin, comes with 36 foam inserts, 12 soft, 12 medium, and 12 firm. The twin size comes with only 18 – 6 soft, 6 medium, and 6 firm. The comfort inserts measure 25″ x 9″ and are 2.5″ thick. To top the mattress off, a 2″ slab of ultra foam is laid across the entire surface area and is finished with a breathable outer cover that’s made from a blend of 83% polyester and 17% glass fiber. I was unable to find any information on the density or ILD rating of the foams that are used in this mattress. When shopping for a mattress, it’s always a good idea to check to see if the foam that’s used in the mattress is CertiPUR-US certified. Being certified lessens the chance of receiving a mattress that is potentially dangerous to your health. CertiPUR-US is a not-for-profit organization that tests foam products and the issues a certification if the foam meets certain standards. Participation in the program is voluntary and there is no cost to the manufacturer. There’s really not a good reason why a mattress should not be certified. In order become certified, the foam must not contain ozone depleters, PBDE, TDCCP or TCEP flame retardants, heavy metals such as lead or mercury, formaldehyde, regulated phthalates, and must have low VOC emissions of less than 0.5 PPM. CertiPUR requires that all foams are retested each year to ensure that they are still in compliance. The CertiPUR website contains an A-Z directory of all participating companies. While Morphiis does not appear on the list, the company “Perfect Pressure” does. Most mattress-in-a-box companies do not give you a choice when it comes to firmness level and those who do may offer only three options. Each Morphiis mattress comes with enough foam inserts to allow you to configure your mattress in 64 different ways. While 64 options to choose from may seem overwhelming, they make it easy by offering a few popular configurations suggestions. They also have a tool on their website that provides recommended configurations based on a few questions that you answer about your height, weight, sleeping position, preferred firmness, etc. After answering these questions, you will be given an illustration that shows exactly how to set your mattress up. Install the inserts as suggested, sleep on it for a few nights and make adjustments as necessary. You can fine-tune your mattress by swapping out the inserts. For instance, if you have an injury, have a troubled area that needs more support, or are pregnant, you have the ability to adjust the inserts as you see fit. Nearly every mattress comes with some sort of warranty and Morphiis is no exception. Their warranty period is 25 years and covers only the original owner which means that it’s non-transferrable. Most mattresses come with a 10 years warranty, so one that’s 25 years is exceptional. In general, the warranty is similar to nearly every other manufacturer’s with the exception of the extended warranty period that’s 15 years longer than average. Morphiis is available in six different sizes from twin to California king. The price of each mattress differs according to size. Larger mattresses require more material to manufacture, so the cost is going to be higher. Expect to pay between $595.00 and $1,195 depending on the size that you choose. If dropping several hundred dollars on a mattress is not in your budget, Morphiis works with Klarna and Blispay to offer payment plans. Right now, they are offering 0% financing to qualified buyers who pay off their mattress within 12 months. If your balance extends beyond this time period, their financing charges are 19.99% APR. Going the payment route with 0% financing, expect to pay between $49.58 a month and $99.58 a month depending on the mattress size that you choose. The table below shows the cost associated with each size mattress. Buying a mattress online without ever seeing it first hand is a completely new concept for most people. Knowing this, many in the industry now offer “free trial” periods that last anywhere from 30-nights up to a year. Morphiis offers a 100-night trail with a 100% money back guarantee. In the event that the mattress is not a good fit, you can request a refund within 100 days of receiving your mattress with no questions asked. While their return policy is very generous, you really only need a week or two to determine if a mattress is going to work out for you. 100 nights is a bit excessive, although it may come in handy if needed. Returning the mattress is easy. You simply call or email Morphiis and they will schedule a mattress pick-up. Since it can not be resold, your mattress will be donated to charity. Morpiis is a unique customizable mattress that allows both partners to choose a unique level of firmness for each side of the bed. You can choose from a soft, medium, or firm feel and adjust the 6 inserts on each side to any configuration that you desire. This allows you to provide more or less support where needed. Morphiis comes with a 25-year warranty which is better than most mattresses which are offered with a 10-year warranty. A longer warranty period may indicate a higher quality of foam that will not quickly break down or compress. Morphiis is CertiPUR-US certified which reassures that the foam used in the mattress does not contain any harmful chemicals or toxins. A 100-night warranty very generous and will ensure that you don’t end up owning a mattress that you are not happy with. Overall, Morphiis has a lot to offer. It’s customizable, comfortable, supportive and has several other benefits, making it one mattress worth considering if you are thinking about foam. If asked which type of mattress you would consider when shopping, most people would respond with either “Innerspring” or “Memory Foam”. In recent years natural latex mattresses, such as the Spindle, have become a popular choice and for a number of reasons. Unlike viscoelastic polyurethane memory foam mattresses, which are made by mixing together several chemicals to create a reaction, natural latex foam is produced from the sap of the rubber tree and is 100% natural. Natural latex isolates motion just as well as memory foam yet is four times more breathable. In addition, natural latex “bounces” back faster than memory foam and can maintain it’s elasticity for many years. This means a cooler, more responsive mattress that sags less over time. In the past, I’ve slept on several viscoelastic memory foam mattress as well as coil spring mattresses. The Spindle mattress will be the first natural latex mattress that I’ve reviewed, so I’m really looking forward to it. I’m going to spend the next two weeks trying out this mattress and putting it through a series of tests to demonstrate properties such as firmness, heat retention, and motion isolation. When ordering, I chose the queen size “medium” firmness mattress based on the tool available on their website as well as personal preference. My Spindle mattress was shipped from Acton, MA via UPS ground and arrived quickly in three boxes. The larger box measured 16″ x 16″ x 36″ and weighed 55 lbs. It had a sticker attached that read “open first” and contained the mattress zipper cover as well as a 3″ slab of medium latex foam. The two smaller boxes measured 16″ x 16″ x 24″. One box weighed 39lbs and contained another 3″ slab of medium latex while the other weighed 48lbs and contained a 3″ layer of firm latex. It made sense that the firm latex weighted 11lbs more than the medium because it’s a denser foam. Combined, the three boxes had a total shipping weight of 142 lbs. Breaking the mattress down into three parts made moving it manageable, especially with two people. Once I had all three boxes in my bedroom, I removed the contents of each and disposed of the boxes to make room for assembly. The Spindle mattress is roll-packed which reduces shipping volume and shipping costs for the manufacturer. Before putting this mattress together, you must cut and remove the plastic from each layer of latex as well as the zipper cover to allow it to expand. 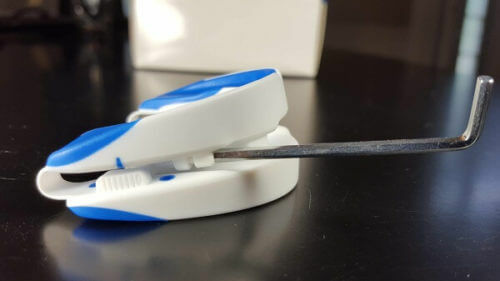 Using a very sharp pair of scissors, I opened each item being careful not to cut the latex. A sharp pair of scissors will glide through the plastic and make this process easy. I read over the assembly instructions that came with the mattress and watched the assembly video on their website before moving forward. Keep in mind, this bed weighs a bit more than the standard coil spring mattress, so having a foundation that provides proper support is essential. Spindle recommends a frame that has a head-to-toe center support that touches the ground and 3/4″ solid wood slats that are spaced no more than 3″ apart. My platform bed met these requirements, so I was ready to go. Since I had ordered a medium mattress, the assembly configuration for this firmness level was one firm layer followed by two medium layers. Before I started putting this mattress together, I had concerns that the latex would shift or bunch up because the layers would not glue together. Once I handled the latex, it was clear that the layers of latex were not going anywhere. The smooth surface of each piece of latex causes each piece to stick to each other. It’s impossible to drag each layer into place. You must grab the latex with two hands and sort of shake it into place using a wave action. The process of lining up each layer of latex is easiest with one person on each side of the foam slab. I began by unzipping the mattress cover and laying it out on the platform. I laid down the first slab of latex, which in my case was firm, being careful not to rip the material. I spent a little extra time lining up with corners and edges of this layer because this was the base in which the other two layers of latex laid on top. Spindle does an excellent job labeling each piece of latex with “medium” or “firm” as well as a tag indicating which side goes up. Honestly, it would be fairly difficult to mess up the assembly process if you read the tags that are attached to each piece of foam. The next two layers of medium latex took a couple minutes to line up perfectly. Within a few minutes, all three layers were in place and lined up. The final step was to tuck in the topper and slowly zipper it shut. In the end, all of the foam fit nicely inside the cover and the finished product was a nice looking bed. I must admit, at first I was a bit intimidated by the idea of putting together a mattress but in the end I found the process to be very straightforward and simple. After unpacking and reading over the instructions, the setup took about 20 minutes. Not bad. Before getting started, I always give the mattress the sniff text. There’s nothing scientific about the smell test. I simply give it a whiff and describe to you what I smell. Some polyurethane foam mattress give off a strong chemical smell when first opened. This is caused by off-gassing where volatile organic compounds (VOC’s) are released into the air which can sometimes cause irritation to the sinuses and airway. In some cases, off-gassing can cause headaches, nausea, or airway discomfort. Fortunately, Spindle is made from a 100% natural latex material so you will not experience any issues with off-gassing. However, natural latex does have a scent that can be described as “sweet” which is especially noticeable when assembling the bed. After a few days, the smell will disappear. I would describe the smell of this mattress as vanilla-like. When unpacking, my wife walked into the room and commented that it smelled like fresh baked cookies. However you describe it, the smell of the natural latex is not at all offensive and gradually goes away. It’s a fact – our body is designed to sleep on the cooler side rather than warmer. As we fall into a deep sleep, our body temperature drops as much as 2 degrees. As you can see, sleeping on a hot mattress can be counterproductive to what your body is trying to accomplish. Even the most comfortable mattresses can trap heat and cause you to lose sleep. Memory foam mattresses are notorious for trapping body heat. Many foam mattress manufacturers add graphite or cooling gel to their memory foam to help dissipate heat. Because of the nature of latex, it naturally has an open cell structure which allows air to easily pass through. Also, during the manufacturing process, thousands of pinholes (about 1/4″ of an inch in diameter) are placed throughout the material which helps it to bake evenly. Conveniently, these holes also assist with airflow. 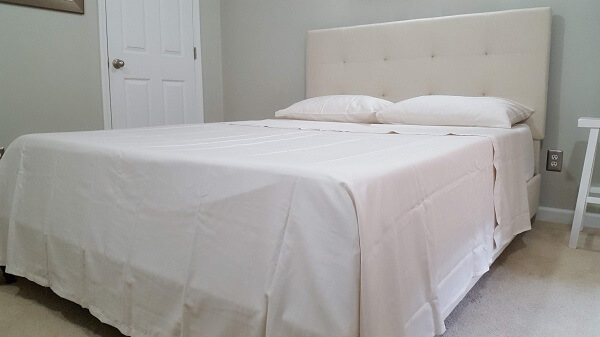 The Spindle mattress cover contains a thin layer of wool, which has moisture wicking properties that will help to remove any moisture from the surface of your skin. When sleeping on the Spindle, I did not experience any issues overheating. My skin remained cool and dry throughout the night. 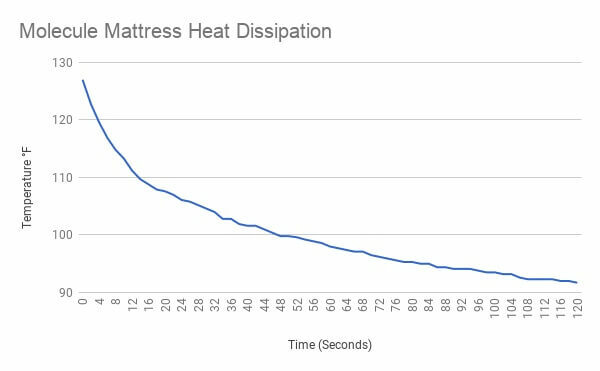 To show how well the Spindle handles body heat, I conducted a heat dissipation test that shows just how quickly this mattress cools down. The test begins by heating a 3lb rice bag in the microwave for 2 minutes and then placing it on top of the mattress for 10 minutes which causes the surface to heat up to around 115° F.
I then removed the rice bag and used an infrared thermometer and stopwatch to measure and track heat dissipation over a 2 minute period. The results are then placed into a graph to give you a visual representation of the heat loss. As you can see from the above chart, heat loss was most rapid during the first 30 seconds, dropping from 115° F to 98° F or 17° F.
Over the next 30 seconds, the Spindle lost 4.8° F.
Between 60-90 seconds the temperature dropped an additional 3.3° F.
Finally, during the last 30 seconds, the temperature fell another 2.1° F.
The temperature of the Spindle Mattress dropped 27.2° over the course of 2 minutes. In other words, the Spindle mattress cooled quite well. Everyone has a preference when it comes to the firmness level of their mattress. The firmness of a mattress can range from very soft to very firm, although the majority of people prefer a medium or medium-firm mattress. The firmness level that you choose depends greatly on the position that you typically sleep in. For instance, a side sleeper who enjoys the feeling of sleeping buried inside a mattress may decide to go with a soft mattress. Spindle can be configured into 4 different firmness levels by alternating the layer configuration with a “medium” and “firm” latex. I decided to go with the medium firmness Spindle which featured a firm layer at the bottom and two medium layers above. Before offering my opinion, you should keep in mind that the firmness of a mattress can be somewhat subjective. That being said, I agree that Spindle medium is, in fact, a medium firmness mattress. On a 1-10 scale (10 being extra-firm), I would rate this mattress at a 6. As with every mattress that I test, I placed a bucket filled with 42lbs of concrete and measured how far the bucket sinks into the mattress. When the weight was added, the mattress surface sank 2.5″. The amount of drop is consistent with other medium firmness mattresses that I’ve tested. While the mattress that I ordered contained two layers of “medium” latex and one layer of “firm” latex to create a medium feel, I experimented with the firmness level of the mattress by altering the configuration of the three layers. The instructions that came with the mattress showed the firm layer as being at the bottom followed by two medium layers above. With all three layers, the holes were facing down. 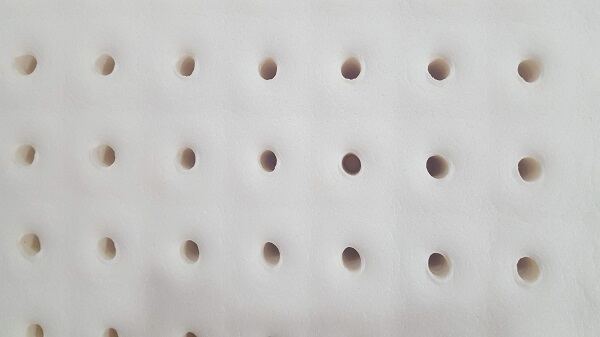 In an attempt to make the mattress firmer, I arranged the latex in the following configuration, starting at the bottom – medium with holes facing up, firm with holes facing up, and medium with holes facing down. I zipped the mattress back up and laid on it in order to get a feel for how it compared to the original configuration. With this arrangement, I would describe the feel as slightly firmer, perhaps a point lower than the original configuration. As for a rating, I would now give it a 5/10. I placed the 42 lb weight back on top of the mattress and measured a drop of 2.25″, which is a 1/4″ less than before. To take it a step further and create a feel that’s even firmer, I rearranged the three layers of latex once again. This time, I started with a base layer of medium latex followed by a medium layer at the middle and a firm at the top. All three layer of foam faced up. In this configuration, the layers are arranged completely opposite from the original configuration. Once again, I zipped up the mattress and laid down to get a feel. This time, there was a noticeable difference in the level of firmness. Compared to the original configuration, the mattress felt much firmer. I placed the weight on top and measured a drop of only 1.75″ which was 3/4″ less than the when originally tested. When arranged in this configuration, I would rate the firmness of this mattress somewhere around a 3/10. Below is a summary of the three configurations that I tried and the results of each. Body support is often overlooked by those who shop for a mattress. Remember, body support and mattress firmness are completely different, so each should be considered independently. It’s easy to assume that a soft mattress provides less support in comparison to a firm mattress. The truth is that there are plenty of ultra soft mattresses which are very supportive. Support comes from the layers below the comfort layers. With innerspring mattresses, support is provided by the coils. With a foam mattress, a denser foam is often used below the comfort layer to provide proper support. 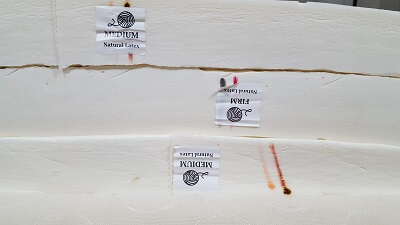 In the case of the medium spindle, the mattresses firmness comes from the firm bottom layer of latex, although the other two layers also contribute to support. The best way to determine if a mattress is supportive is to lay down in your normal sleeping position and allow someone to observe your spinal alignment. If your body is bent into a U shape, the mattress does not provide enough support. My wife and I observed each other’s body alignment as we laid on the Spindle. We both concluded that the Spindle provided good support and pressure point relief. The latex does an excellent job supporting heavier areas such as the upper back and buttocks. Recovery time refers to the amount of time that a mattress takes to “bounce back” when weight is removed. 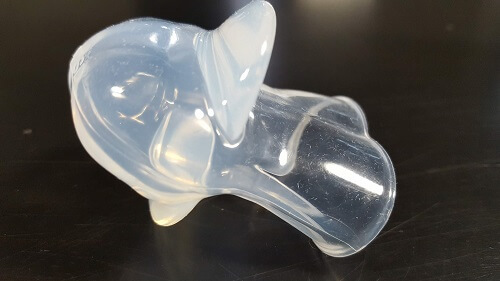 While some viscoelastic foams have a moderately fast recovery time, many are quite slow to respond. This is an area where the Spindle mattress excels. Due to the nature of a 100% natural latex material, the recovery time is very fast. As you can see in the video above, this latex mattress bounces back immediately when you press down on it. The action is spring-like and there is absolutely no delay. This fast response makes latex a unique product in comparison to petroleum-based foams which simply can not compete. The Spindle is not going to leave you feeling stuck inside of the mattress. The super responsive nature of the mattress allows you to roll over without much effort. Motion isolation or motion transfer refers to how well a mattress absorbs motion. In other words, are you going to feel your partner toss and turn throughout the night? Certain types of mattresses isolate motion better than others. For instance, coil spring mattresses such as the Bonnell spring system contain hundreds of springs that are wired together. As you can imagine, when one partner moves, the entire mattress moves. Individually encased pocked coils were eventually introduced which offer much better motion isolation. Viscoelastic and latex foam mattresses are known to have superior motion isolation because they contain no springs. When one person moves, their partner experiences very little disturbance. On one side of the bed, I placed a wine glass that was half filled with water. 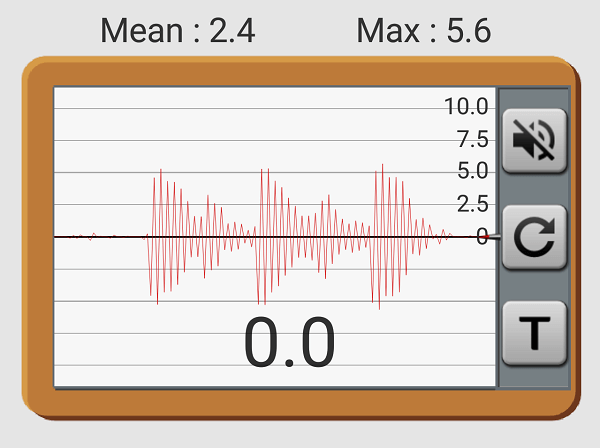 Nearby, I also placed a smartphone which ran a vibration meter app. On the opposite side of the bed, I dropped an 18 lb kettle ball from a distance of 12″. This test was repeated three times. You can see in the video above that the Spindle mattress transfers very little motion. The glass experiences some movement but didn’t come close to tipping over. 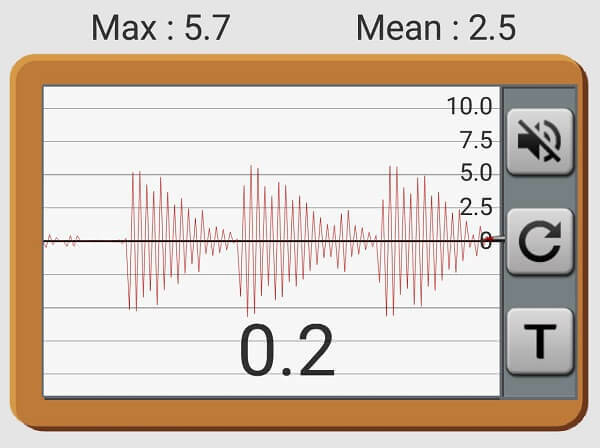 As for the vibration meter, it showed a mean MMI reading of 2.7 and a max reading of 6.3. The Spindle mattress isolated motion as well as most viscoelastic foam mattresses that I’ve tried. When sleeping on the mattress, neither my partner nor I experienced any issues with each others movement. This is one mattress that I would not be concerned about when it comes to motion transfer. Edge support is something that you will want to consider, especially if you are sharing your bed with a partner. With some foam mattresses, you may experience the feeling of being tossed from the bed as you lay close to the edge because the foam compresses. Higher density foams are sometimes used near the edge to combat this issue. The spindle contains three layers of natural latex with a high ILD rating. While the edge of the mattress does compress some as you move towards the edge, I was still able to lay securely in bed without the feeling of being ejected. This mattress doesn’t have a super firm edge, but sleeps well across the entire surface area. Perhaps your partner has a tendency to take up most of the bed, leaving you only a small area towards the edge. With the Spindle, this is not going to be an issue. Neal Van Patten founded Spindle in 2013. He comes from a family that has been in the mattress manufacturing industry for four generations. Prior to forming Spindle, Van Patten had worked for his families’ Syracuse, NY-based mattress company which was founded in 1915. He also spent four years working as a project leader and quality manager for two very large mattress companies. Van Patten took notice of the underserved and overpriced latex mattress industry. While most mattress-in-a-box companies use viscoelastic polyurethane foam in their mattresses, he decided to go a different route by choosing latex – a 100% natural product that’s more breathable and offers a different feel in comparison to the memory foam. With the help of a marketing director and an operations manager, Van Patten currently operates the company out a 6,000 sqft warehouse in Acton, Massachusets. The company prides itself on delivering a premium quality latex mattress that cost thousands of dollars less than what you would find at a mattress store. They are able to offer such a large discount because they cut out the middleman. Their approach is to buy their materials directly from suppliers and complete the final assembly of each mattress in-house before selling direct-to-consumer. The Spindle mattress is 10″ thick and is made from four different layers of material – 3 layers of latex topped by a cotton zipper cover that’s filled with Ecowool. Spindle seems to be very mindful of quality and safety when sourcing the materials that are used in their mattresses. When possible, most of the components that go into their mattresses are sourced domestically and assembly of the final product occurs in Acton, Massachusetts. They seem to be very transparent with where they source their materials. Starting from the bottom, you will find 3 slabs of 3″ thick natural latex. The firmness of each layer will vary depending on the overall firmness level that you choose when ordering. For instance, with the “soft” mattress, all three layers will have a medium density while a “firm” mattress will contain 2 firm layers followed by one medium layer on top. Some latex manufacturers create a blend where natural latex is mixed with a synthetic material. Often times, these blends are only 30% actual latex to 70% synthetic. Spindle uses 100% real latex in their foam. Technically speaking, the latex is 95% raw latex sap and a 5% curing package which is necessary to convert the liquid sap into a solid sheet. The process of making latex starts by collecting sap from the Hevea Brasiliensis rubber tree, which is grown and harvested in the Asian Pacific as well as Guatemala. The sap is shipped to Mountain Top Foam, based out of Mountaintop Pennsylvania, where it’s transformed into latex foam that’s used in the Spindle mattress. Their factory uses the continuous pour Dunlop method to manufacture its foam. Continuous pour Dunlop latex is created by combining the milky latex sap with soap and then adding a vulcanizing accelerator before pouring the mixture over a slowly moving conveyor belt. After being poured, molds that contain “pins” are dropped on top of the latex. These pins ensure that the material is evenly heated throughout as the latex passes through an infrared heat source to cure it. This process is known as Vulcanization. After curing, the latex foam is washed three times to remove any residual proteins and then dried. In order to create a soft cloud-like feel, approximately 1″ (20oz per square yard) of EcoWool is added to the top of each Spindle mattress. EcoWool is 100% real wool that comes from sheep that are raised in Oregon and Northern California. The cool, damp weather in this area creates ideal grazing conditions for sheep. EcoWool is similar to organic wool but without the certification. Growers are required to not use chemical pesticides, hormones, antibiotics, or herbicides around their sheep. Growers of EcoWool are able to offer a product that’s identical to organic wool without having to pay the high cost of being certified organic. Once collected, the wool is then “carded”, or cleaned and detangled at Woolgatherer Carding in Montague, California. One advantage of wool is that it’s naturally flame retardant. 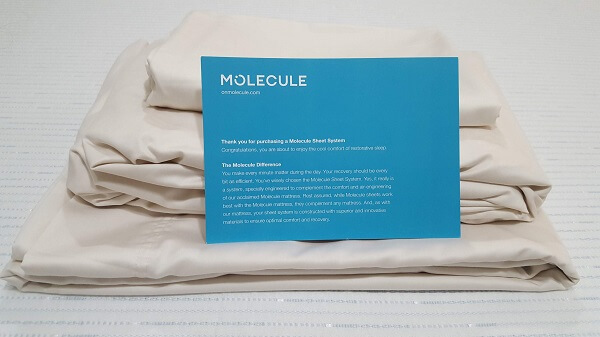 Most petroleum-based polyurethane mattresses are highly flammable, so they are treated with fire retardant chemicals such as Decabromodiphyenyl Oxide, Antimony, and Boric Acid. These controversial chemicals have been linked to a number of different health issues. Another advantage of natural wool is its moisture wicking properties which helps to draw moisture created by sweat away from the body, keeping the mattress cool and dry. The sleeping surface of the mattress is made from woven organic cotton grown in New Mexico, Texas, or India and does not contain pigments, bleach or pesticides. Spindle prefers to source their cotton from the United States depending on the season. The cotton is woven in a South Carolina cotton mill before being shipped to New England for final assembly. The latex foam that’s used in the Spindle mattress is OEKO-TEX certified, meaning that it has met the human-ecological requirements of the STANDARD 100. OEKO-Tex is an organization that was founded in 1992. In order to be labeled as STANDARD 100, the material must undergo lab testing to detect harmful substances which must remain below the strict limits that are established by the organization. The Spindle website posts their foam factories certification, which I verified by visiting the OEKO-Tex website. While most mattress-in-a-box companies only offer one option for firmness that they consider to be “universal” Spindle offers a soft, medium, firm, and extra firm. 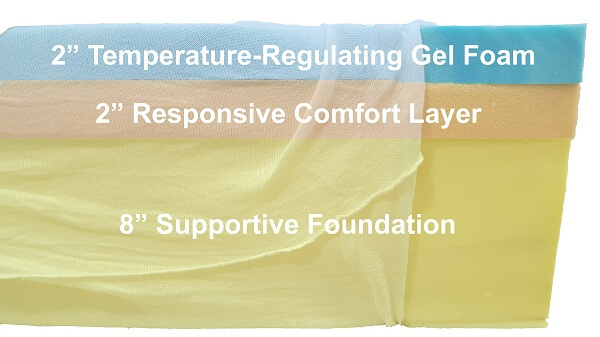 Each firmness level can be created by swapping out the three layers of latex using either a medium latex or firm latex. By simply altering the layers of foam, you can achieve several different firmness levels. 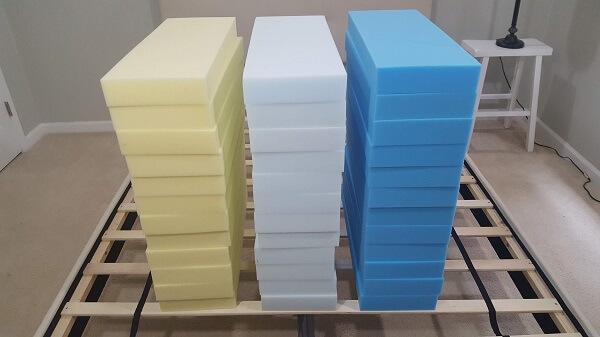 Depending on which firmness level that you choose, Spindle will send the correct configuration of latex foam slabs that will be used to build your mattress. It’s up to you to place them in the correct order. The chart below shows the configuration of the four different firmness levels. What’s the difference between the Medium and Firm latex material? ILD refers to how many pounds it takes to compress a 4″ slab of foam by one inch or 25%. The higher the number, the firmer the foam. The density of a foam is simply how much one cubic foot of foam weights. A denser foam will weigh more. As you can see, their “firm” foam has a much higher ILD and density rating in comparison to their medium foam. Spindle does offer a tool which can help you choose an ideal firmness level for their mattress. On their website, you can enter your height, weight, sleep position, and desired firmness and it will generate a firmness level for you. You can also use your BMI to help decide which firmness level to choose. Those with a BMI less than 19 may choose a soft. If your BMI is between 19-25, a medium may work. A firm is suitable for those with a BMI between 26-31. This mattress may not work for those with a BMI greater than 31. Don’t know your BMI? Just google “BMI calculator” and you will find several calculators to choose from. You should also consider your sleeping position. Soft mattresses are better suited for side sleepers while a medium mattress will work for both side and back sleepers. Frim can be a good choice for all three sleeping positions. What If I Choose The Wrong Firmness? One nice feature that you will find with this mattress is that if you find it to be uncomfortable the way that you ordered it, you can contact their customer service who seems eager to help. For instance, if you order a medium mattress and find that it’s too soft, they may ask you to rearrange the layers of latex as I did in the section above. By doing so, you can significantly increase the firmness of your mattress without having to request new layers. In other cases, additional layers may be required in order to reconfigure their mattress. Perhaps you order a medium and find it to be too firm. They may send an additional layer of medium latex to make your mattress softer. As you can see, this mattress is quite versatile and the company wants to ensure that you are satisfied with your purchase. Spindle offers a 10-year limited warranty on their mattresses, which is a fairly standard warranty period in the mattress industry. One unique attribute of this mattress, as compared to memory foam, is that it tends to last longer because latex doesn’t compress as easily as polyurethane memory form. Most foam mattress manufacturers will replace a mattress that sags more than 1.5″ during the 10 year warranty period. Spindle lowers the threshold to .75″. They will replace any defective material, free of charge, within 10 years from the date of purchase. Damage, abuse, misuse, stains, burns, unsanitary conditions, etc. In addition, they also offer a 25-year comfort life program which allows you to replace any layer at a 30% discount. For instance, if the top layer of latex wears out after 17 years, you can purchase one layer for say $360.00 minus a 30% discount or $252.00. Instead of replacing the entire mattress, you can rejuvenate it and save money in the long run. Depending on which size you choose, the price range of a Spindle mattress is between $1099.9 and $1,849.99. While slightly more expensive than a run-of-the-mill polyurethane mattress, the cost is significantly less than comparable latex mattresses that can be found in brick and mortar showrooms. 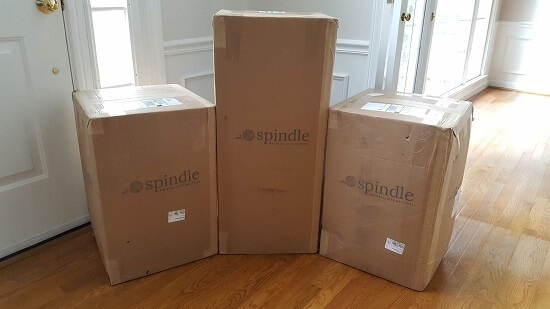 Spindle has offered our readers $200 off their order. Simply click the button below or enter “SMG5” at checkout. 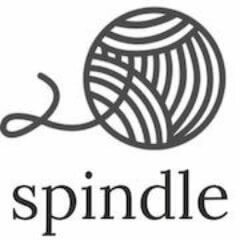 Spindle offers free shipping on all orders. Massachusetts residents are required to pay sales tax on purchases. Spindle offers a very generous 365-night satisfaction guarantee. Their approach is a bit different than most online mattress retailers who offer a “free trial”. Their goal is to ensure that you find the right firmness level and they seem to be more than willing to do whatever it takes to achieve this, including sending additional foam slabs at no additional cost to you. The vast majority of their customers are satisfied with the comfort level that they choose. The few who find their mattress to be too firm or too soft may be offered additional foam so that they can swap out the layers and alter the firmness. Spindle does ask that you allow your body to adjust to the mattress for 1-2 months prior to contacting customer support to troubleshoot firmness issues. Every mattress has a break in period and our bodies need to adjust to sleeping on a new mattress. In the event that they are unable to get you comfortable in your mattress, they will refund 100% of your money. You will be required to remove all identifying tags and submit proof that the mattress was donated in order to receive a refund. It seems as though Spindle is genuinely interested in helping those who want a quality latex mattress and not those who are “mattress-hopping” from one free trial mattress to another. Prior to trying the Spindle mattress, I have never slept on a latex mattress. Now that I’ve experienced latex, I can see why people rave about it. While this mattress does require a more supportive frame and some assembly, the responsive feel of latex is well worth it. If you are an active sleeper that frequently changes positions throughout the night, you will definitely enjoy this mattress. The Dunlop latex is 100% natural and does not produce any unpleasant odors. The latex is Oeko-Tex certified and manufactured in the United States. Also, the wool on top is a natural flame retardant, meaning that their mattresses are not sprayed with harmful chemicals. Spindle comes with a 10-year limited warranty and a 25-year prorated warranty. Because it’s latex, you can expect it to last for a long time. 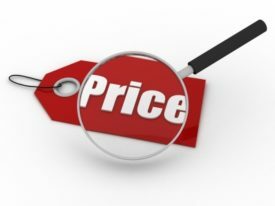 Pricewise, your going to pay a little more for a latex mattress in comparison to a memory foam mattress simply because latex is not a cheap commodity. When you compare the Spindle mattress to similar latex mattress at a brick and mortar store, you will find the price of the Spindle to be $1,000 or so less. They are able to do so by cutting out the middleman and selling directly to the consumer. Spindle does offer excellent customer support and seems willing to work with you to ensure that you are satisfied with your purchase. Overall, the Spindle mattress sleeps cool, comfortable, and provides great support. My recommendation: if this mattress is within your budget, go to your a local mattress store and get a feel for natural latex. 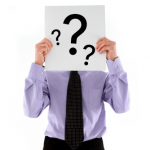 Avoid taking up the salesperson’s time as most are commission based. Simply feel the mattress and move along. If you like the feel of the latex, go home and order the Spindle. You will receive a high-quality mattress for several hundred dollars less. Save $200 by using promo code “SMG5”. Foam mattresses in a box have become popular in recent years as an increasing number of people are choosing the comfort and convenience of buying a mattress online. They can be a great option for those who enjoy the simplicity of online shopping while avoiding high-pressure sales tactics that are often used by mattress stores. Memory foam mattresses can be compressed, packaged, and shipped to your doorstep in a surprisingly small box. Upon arrival, you can easily move it into position before removing the plastic and allowing it to expand into its original shape and size. eLuxury, a company that has made a name for itself selling Luxury sheets at a reasonable price, had recently introduced a selection of foam mattresses to their lineup of products. Their mattresses are handmade in the United States using the same high-quality standards as their sheets. In this review, I’m going test out their 10″ eLux Gel Memory Foam Mattress and present my findings. According to the eLuxury website, warehouse handling time takes between 1-2 business days and transit time is typically 1-5 business days for domestic orders while international orders can take 5-10 days. 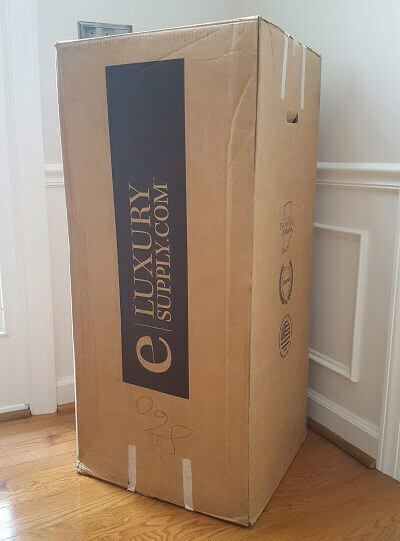 My eLuxury mattress shipped on a Wednesday and arrived by Friday. It was packaged inside of a 19″ X 19″ X 42″ box with a shipping weight of 45 lbs (twin size). I was able to maneuver the mattress by myself, although I could have used a helping hand. Those who order larger mattresses should definitely consider recruiting a helping hand to help carry it. The package contained some information such as setup instructions, a “Thank you” card, and a warranty card. Using a pair of scissors, I carefully cut across the first layer of plastic and unrolled it. I then punctured the vacuum seal and removed the second layer of plastic. Within a few minutes, the bed seemed to have fully expanded, although I allowed it to sit for the full 24 hours as suggested before putting it to the test. Setting up the mattress was super easy and only took a few minutes. It actually took longer to break down the box and carry it to the recycling cart along with the plastic wrapping. Some foam mattresses give off a strong odor, especially once they are unpackaged and decompressed. 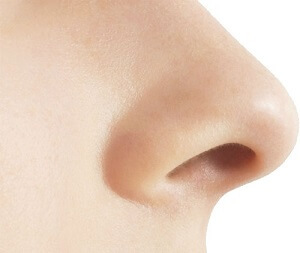 In most cases, the odor usually disappears in a few days, although in some cases the smell can be long-lasting. This smell is caused by off-gassing of Volatile Organic Compounds (VOCs) which are found in all freshly manufactured foams. Adhesives that contain acetone are sometimes used to bind together foams and may also produce a smell. 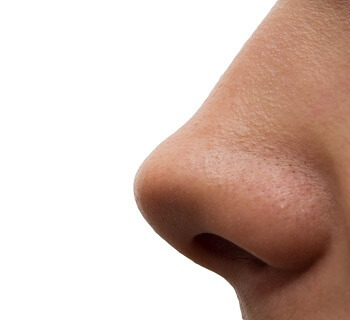 The smell can range from a slight “new” scent to a noxious odor that may irritate the respiratory tract and eyes. In some cases, the odor may cause dizziness, nausea, or headaches. The foam that is used to make the eLuxury mattress is CertiPUR-US certified and one of the certification requirements is that the foam must contain low VOCs levels of less than 0.5 parts per million. Because of this, my expectations were that this mattress would produce little to no smell. After removing the plastic packaging, the first thing that I always do is give it the sniff test, so I placed my face on the mattress and gave it a good whiff. Not surprisingly, this mattress gave off very little odor. The smell that it did give off wasn’t unpleasant at all and disappeared after a couple days. In the early days, foam mattresses gained a reputation for retaining heat. One of the most common complaints was that these mattresses sleep hot. Foam material has come a long way since then and today there are foams that have gel beads incorporated into the material which helps to carry away body heat and allow for cooler sleeping. 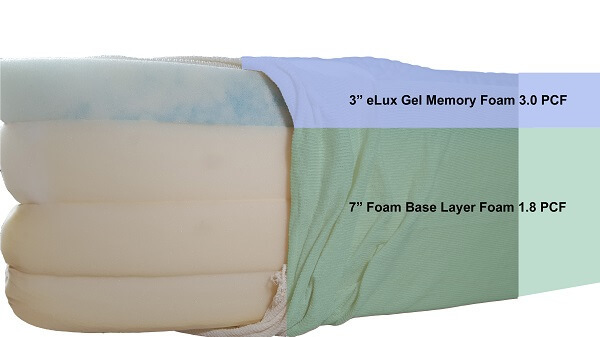 The top of the eLuxury mattress has a 3″ layer of gel foam which helps to facilitate heat removal from the mattress. In order to give you an idea of how well the eLuxury mattress dissipates heat, I heated it up and measured the temperature as it dropped. You can compare the results of this test to other mattresses that I have reviewed. I heated a 3 lb rice bag in the microwave for 2 minutes and then placed it on top of the mattress for 10 minutes in order to simulate body heat. I then removed the rice bag and a no-contact inferred thermometer was used to measure the surface temperature over the course of 2 minutes. You can see the test results in the charts below. 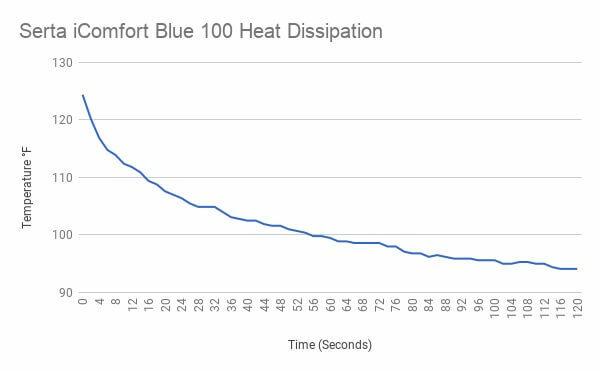 As you can see, the eLuxuary mattress experienced rapid heat loss during the first 20 seconds before gradually slowing down. Here’s a quick summary of the heat loss in 30-second increments. Over the course of 2 minutes, the mattress cooled a total of 30.9°. Considering that it’s a foam mattress, it did an excellent job dissipating heat. When trying out the mattress, I found that it slept as cool as many coil spring mattresses that I have slept on. Mattress firmness, not to be confused with mattress support, describes the feel of a mattress and can range from very soft to very hard. Some mattress manufacturers use a scale from 1-10 to describe the firmness of their mattress. In the end, the firmness of a mattress is somewhat subjective and will vary from one person to another depending on factors such as weight, body style, and sleeping position. There is a method called Indentation Load Deflection (ILD) that can be used to help quantify the firmness or softness of a foam. ILD simply measures the amount of weight that it takes to compress a 4″ slab of foam by 1″ within an 8″ diameter circle area. The more weight required, the higher the ILD rating and the “firmer” the foam. Some mattress manufacturers offer both the foam density rating as well as the ILD while others only offer one and some do not offer either. While eLuxury gives the density of each foam, they do not offer an ILD rating. With each mattress that I review, I add 42lbs of weight and measure how far the mattress compresses. You can use this measurement to compare firmness levels of other mattresses on this site. I placed a concrete-filled bucket onto the bed and used a straight edge to measure how far the top of the mattress compressed. As you can see in the video above, the mattress compressed 2 3/8″. eLuxury states that their mattress is a “medium”. The firmness test showed results similar to other medium firmness mattresses that I’ve tried. The feel of this mattress is not too hard yet not too soft – somewhere in the middle. I will have to agree that this is a medium firmness mattress with a rating somewhere around a seven. While you may find that a mattress has the desired firmness level, this does not necessarily mean that it offers proper support. Support refers to how well a mattress provides pressure point relief while aligning your spine. Sleeping with too much or too little support will misalign your body and cause discomfort during your waking hours. A mattress that provides proper support can have a firmness level that may fall anywhere between very soft and very hard. For this reason, it’s important not to confuse the two. The way to determine body support is to lay on the bed in your normal sleeping position and have another person observe your body alignment. If your body is in a “V” or “U” shape, the mattress is not providing enough support. When laying on this mattress, I had my wife take a close look at my body alignment and she found that my spine was aligned when laying in both the side and back sleeping positions. I’m 215 lbs and felt as though it did a great job providing proper support. eLuxury uses a combination of 2 fairly dense foams which help to provide good pressure point relief compared to a lower density foam. I would say that this mattress should support most body types. Keep in mind that if you are a larger person, the foam is going to compress more and support may become an issue if your weight is in the upper 300’s. Depending on the type of memory foam used, every mattress will have a different recovery time once compressed. A slow responding foam mattress can make it difficult to change positions and may leave you feeling stuck inside of the mattress. You may want to choose a foam that contours to the shape of your body but quickly returns to its original shape once weight is taken off. Since this mattress does not contain any coil springs, you should consider the recovery time. In the recovery time test, I press firmly on the mattress and observe the response time. Take a look at the video above and you can see for yourself. The foam that’s used in the eLuxury mattress recovers very quickly. The base layer bounced back almost immediately while the gel foam comfort layer only took about a second to recover. When laying on the mattress, I did not experience the feeling of being stuck. I was able to roll over multiple times without any issue. Motion isolation or motion transfer refers to how well a mattress can isolate movement. This is especially important if one or both partners toss and turn throughout the night or make frequent trips to the restroom. When it comes to motion isolation, this is an area where most foam mattresses are superior. While a quality pocketed coil mattress works well to isolate motion, a foam mattress almost always performs better. I performed a weight drop test in order to give you an idea of how well this mattress isolates motion. On one side of the bed, I dropped a 17.6 lb weight from a distance of one foot. On the opposite side, I placed a wine glass that was half-filled with water. 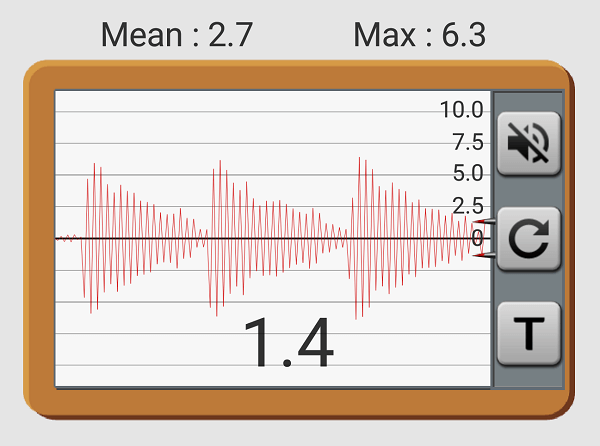 I used a phone app to measure vibration that occurred. The weight drop test was performed three times and the results are shown below. As seen in the video above, very little movement of the glass occurred with this mattress. Also, the vibration meter registered low scores with a mean of 2.5 MMI and a max of 4.5 MMI. As anticipated, the eLuxury mattress performed quite well in motion isolation test. Edge support simply refers to how well the edge of a mattress supports your weight. This is important because a mattress with good edge support allows you to utilize the entire surface area. A mattress without a supportive edge can cause the feeling of being ejected from the bed if you lay too close to the edge. Also, a bed with poor support will make tasks such as putting on your shoes difficult. To test the edge support, I first sit on the edge of the mattress and then lay down in the center and roll toward the edge to see how it feels. While sitting on the edge, the mattress seemed to provide a fair amount of support, although it was not as supportive as other coil mattresses that I’ve tried. While laying down, rolling around or sleeping on the bed, I didn’t experience the feeling of being tossed from the bed. I found the edge support to be satisfactory. The foam used in the mattress allows you to enjoy the entire area of the mattress without fear of being ejected from the bed. eLuxury is privately owned and operated by Paul Saunders of Evansville, IN. Saunders was a former Marine officer and Naval academy graduate who stumbled upon the idea of selling high-quality, reasonably priced sheets while searching for a sheet set to give to his wife as an anniversary gift. While shopping, he had become disappointed with what the market had to offer. Saunders noticed that there was a lack of high-quality sheets being sold at a reasonable price. He thought about creating an e-commerce website that would fill this void. This idea soon became reality in 2009 when Saunders launched an e-commerce store and fulfilled orders from his garage. In 2013, as the business outgrew his home, he relocated operations to a nearby warehouse. The company soon began expanding far beyond sheets to include mattress pads, pillows, blankets, quilts, duvet covers, pillowcases, sheets, and comforters. They also sell a number of other household items. eLuxury eventually decided to start manufacturing several of their own products. In 2014 they purchased a factory in Tennessee and had become both a manufacturer as well as an e-commerce seller. Since then, they have moved this manufacturing facility to Evansville, Indiana which has brought hundreds of jobs to the area. 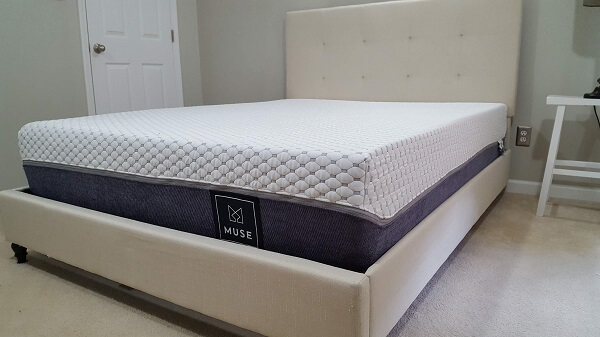 Most recently, eLuxury decided to capture a portion of the rapid-growing mattress-in-a-box market by offering three different mattresses including their 8″ Gel Foam, 10″ Gel Foam, and the 12″ hybrid mattress. Today, eLuxury is the fastest growing company in Indiana and the fourth fastest growing company in the US. eLuxury believes in giving back and is committed to supporting their local community as well as several national organizations such as the March of Dimes, Toys for Tots, Soldiers Dogs for Independence and St. Judes Children’s Hospital. A high-quality foam mattress will offer both proper support as well as a cool and comfortable sleeping surface. In order to achieve this, two or more foam materials need to be joined together, which is exactly what eLuxury did. First, a 7″ layer of base foam with a density of 1.8 lbs is used to provide the support that your body needs in order to maintain alignment and quick response when weight is added or removed. The pound rating refers to the density of the foam and is simply the weight of one cubic foot of a particular foam material. Typically, a more dense foam will weigh more. On top of the base layer is a 3″ layer of comfort foam which is no ordinary piece of foam. This is a dense layer of 3 lb gel-infused foam which offers a soft and comfortable surface along with cooling properties. Standard memory foam has a tendency to trap heat, so gel beads are added to the foam which helps to dissipate heat. This keeps your body cool and dry throughout the night. The mattress is covered with a material that’s a blend of 80% polyester and 20% spandex and has a nice feel that’s not too thin yet not too thick. Safety is a concern that’s at the top of most people’s list. On average, a person sleeps for 8 hours per night. This means that we spend 1/3 of our lives in bed which is why it’s important to know exactly what’s inside of your mattress. 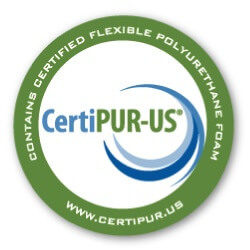 In 2008, the CertiPUR-US certification program was created in order to address the issue of potentially dangerous foams that were being imported and used in furniture manufacturing. eLuxury is currently listed on the CertiPUR-US directory as being an active member. Both their foam and mattresses are made in a factory in the state of Mississippi. This mattress is only offered in one level of firmness, which the manufacturer describes as medium or 7 out of 10. The majority of people find a medium firmness mattress to be comfortable. If you prefer a very soft mattress or a very firm mattress, this mattress may not work for you. If you are unsure of which firmness level is right for you, there is a good chance that this medium will work. Will It Support Heavier People? This mattress supports up to 800 lbs or 400 lbs per side, so even if you are on the heavier side, it should provide enough support. The 10″ foam mattress from eLuxury comes with a 10-year full coverage warranty. A 10-year warranty is fairly standard in the in the mattress industry. eLuxury provides a warranty card with each mattress, which lists the details as well as all of the exclusions that apply. The eLuxury mattress varies in cost depending upon size. Expect to pay between $489.99 – $799.99. In comparison to other 2-layer gel foam mattresses, this one is priced fairly. If you prefer to make monthly installments, this is an option with the eLuxury mattress. They have partnered with Bread to offer easy and affordable financing. Your monthly payment is determined by your interest rate which is determined by your credit score. The table below shows the monthly payment amount with an interest rate of 9.99% APR over a 36-month term. This payment amount will, of course, vary by individual. In addition to using Bread, you can also choose PayPal credit and receive interest-free financing for six months. Shipping is free on orders over $50, so any size mattress qualifies for free shipping. As with most online mattress stores, eLuxury does offer a trial period in which you try out their mattress and if you are not satisfied, you can return it for a full refund. The idea may seem difficult to believe, but such offers are not uncommon in the online mattress industry. After all, most buyers are reluctant to purchase a mattress online because they are unable to lay on it first. A trial period helps to ease this fear. eLuxury offers a 120-night trial period in which you can test out their mattress to see if it’s right for you. The length of this trial period is slightly better than average compared to others who are selling similar mattresses. If you decide that this mattress is not for you at any time during the trial period, contact them and they will send someone to pick it up and issue a refund for 100% of what you paid. The mattress will be disposed of or donated to a local shelter. The truth is, you will know if the mattress is right for you within the first 3-4 weeks, so a trial period that lasts 4 months is really excessive. Keep in mind that a new mattress will offer more support than an old one. Because of this, it may be somewhat uncomfortable for the first few weeks until you break it in and become accustomed to sleeping on it. There are a lot of factors that one should consider when choosing a mattress. The first step is to decide which type of mattress may be right for you. Foam mattresses, such as the one offered by eLuxury, are a great alternative to traditional coil spring mattresses. You can order one online and it will arrive at your doorstep within a few days. I found the eLuxury mattress to be an all-around great value. The company offers a quality foam mattress that covers all bases at a reasonable price. It’s not the cheapest 10″ gel foam mattress out there but certainly nowhere near the most expensive. As for comfort and performance, this mattress did not disappoint. It sleeps cool and comfortable while providing excellent support and superior motion isolation. It’s made from CertiPUR-US foams that are made in the US. This mattress does not contain toxic chemicals and does not smell. The 120-night trial allows you to ensure that the mattress is a good fit for you. The gel foam mattress from eLuxuary is one that should be considered if you are interested in an all-foam mattress.